Let’s jump right into the ORC reveal, shall we? Welcome to the OASIS!!!! I named this renovated kitchen and dining room “The Oasis” because it has plants and it reminds me of Morocco. As you can see, I am a terribly creative person that has no problem taking risks at naming anything and EVERYTHING that crosses her way in an extraordinary way that nobody else would have thought about before. Also, this paragraph is proof that my self-confidence and sense-making is running low today. It must be the extra 40 pounds I have in my body due to pregnancy OR the fact that I need to write this post in half hour. 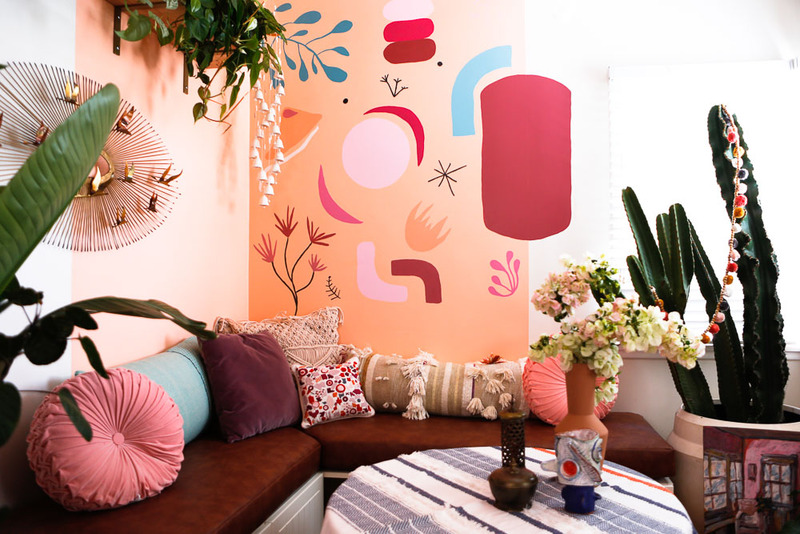 For information about who the heck am I and why do I like pinks and corals so much, go here. Ok, dear readers. Here is how the kitchen and dining room area looked before the challenge started. 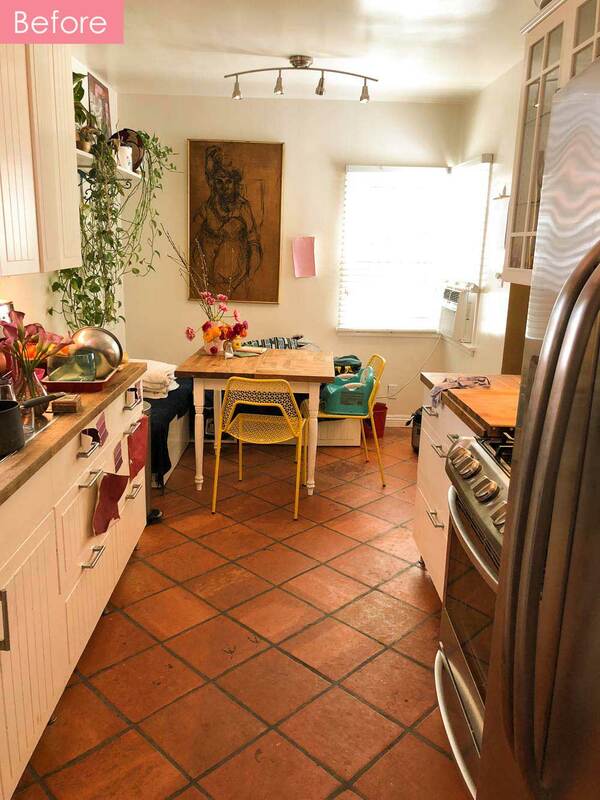 As a reminder, my home is 900 sq ft, in case you were wondering why my kitchen and dining are so small. For more “before” photos, go to Week 1. 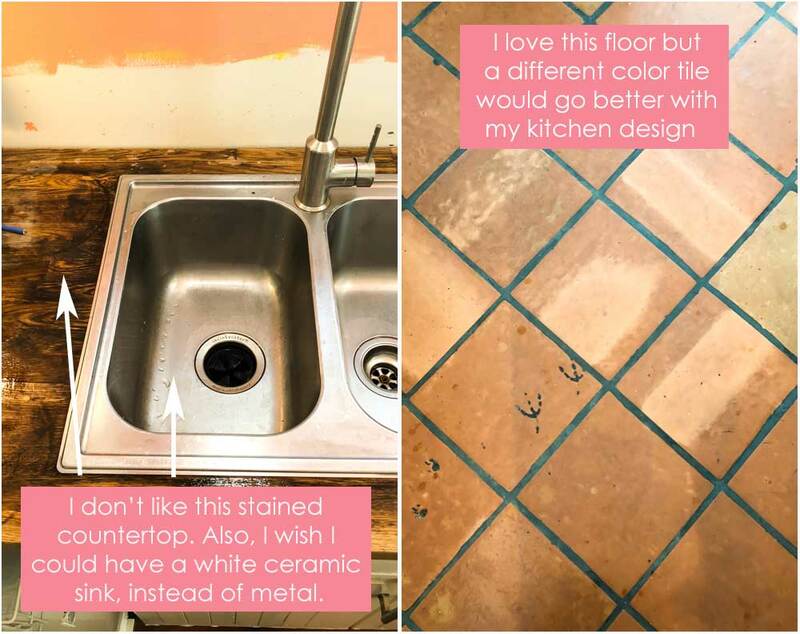 I am embarrassed to show you those photos in this reveal post because they have dirty dishes and it is kind of gross. 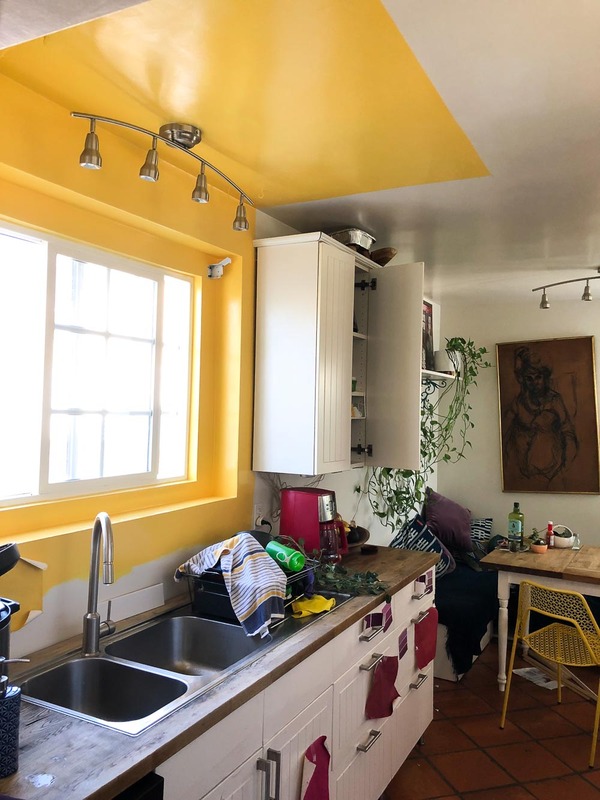 Anyway, let me show you what you came here to see, the “after” photos: The most significant change we made to this kitchen, aside from the mural, was the cabinet doors and fronts. 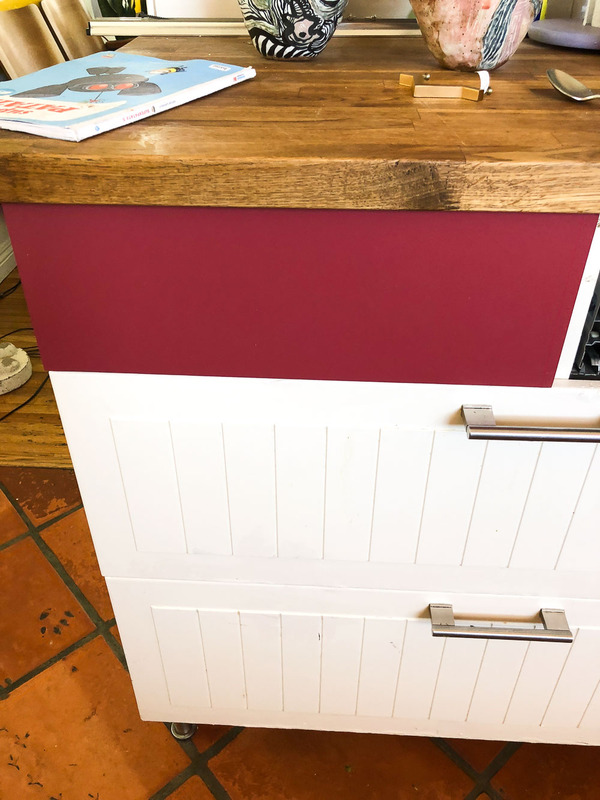 Before we started the challenge, we had an IKEA kitchen made of laminated pressed wood that didn’t pass the test of time. It had horrible stains and watermarks within months of buying it (see here). 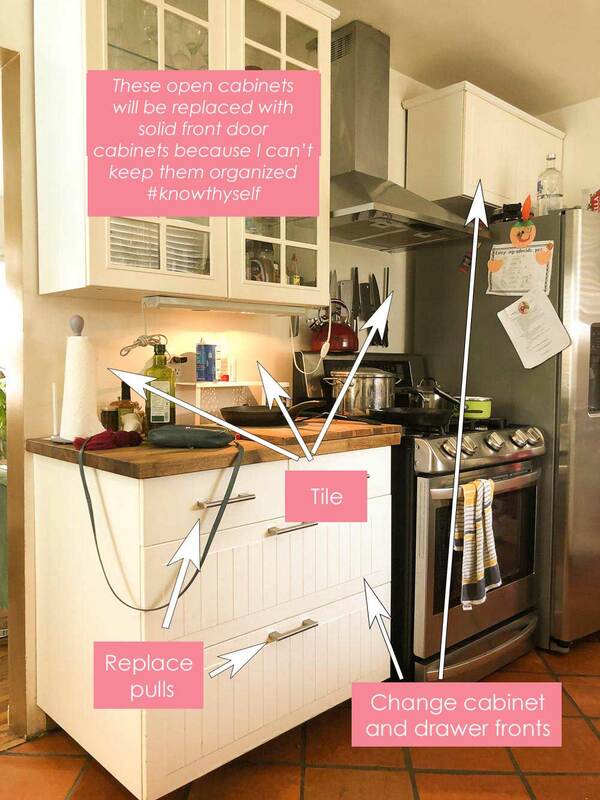 This is why I was so excited to work with Cabinet Door Mart to replace those horrible fronts. I chose to get unfinished Artesia cabinet doors and Auburn solid drawer fronts. George (my partner in crime) and I painted these ourselves. It was not that hard because we used a Spray painter that was awesome. More on that process here. 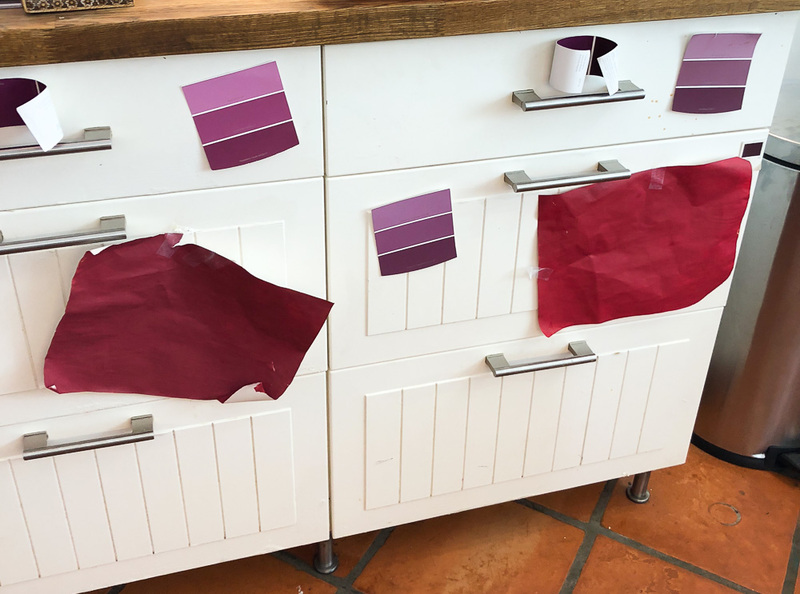 In the beginning, I wanted to paint the top cabinets white and the bottom ones in this radicchio color, but then I realized that painting all the cabinets with the same color would look a lot more AWESOME, so that is what we did. 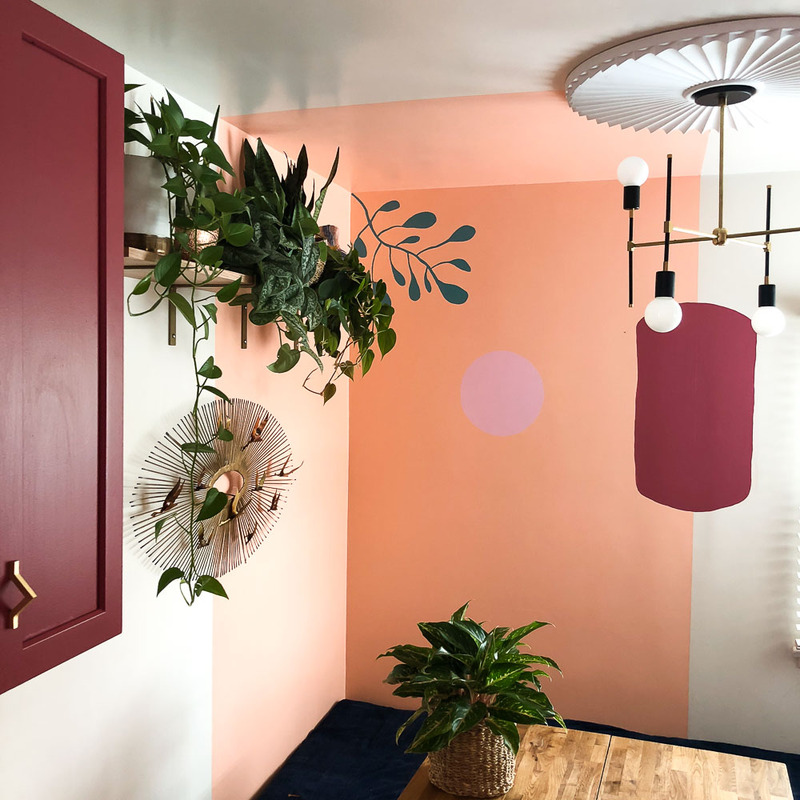 The color is Radicchio from Farrow & Ball, but we matched the paint in Benjamin Moore paint because I have a small budget and can’t even afford to look at the Farrow & Ball website. 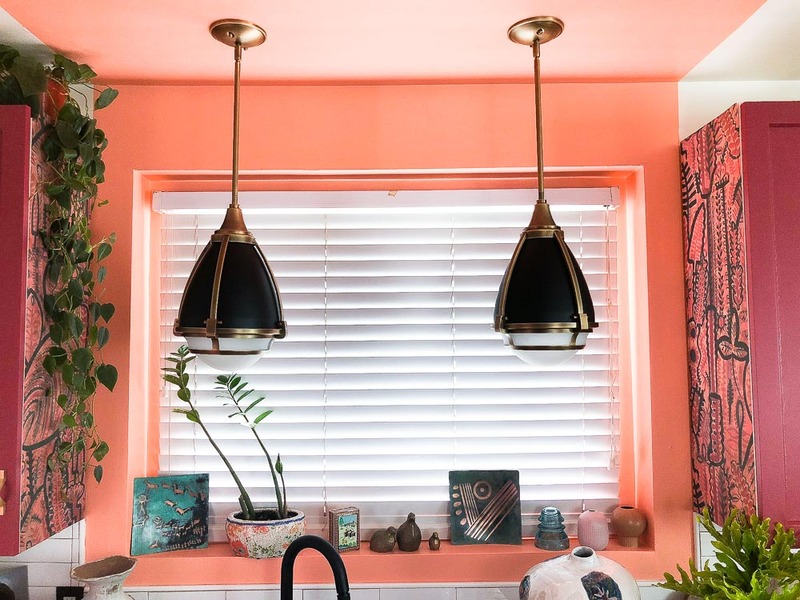 I have gotten a lot of questions about these pendants over my sink which are absolutely beautiful, in my opinion. 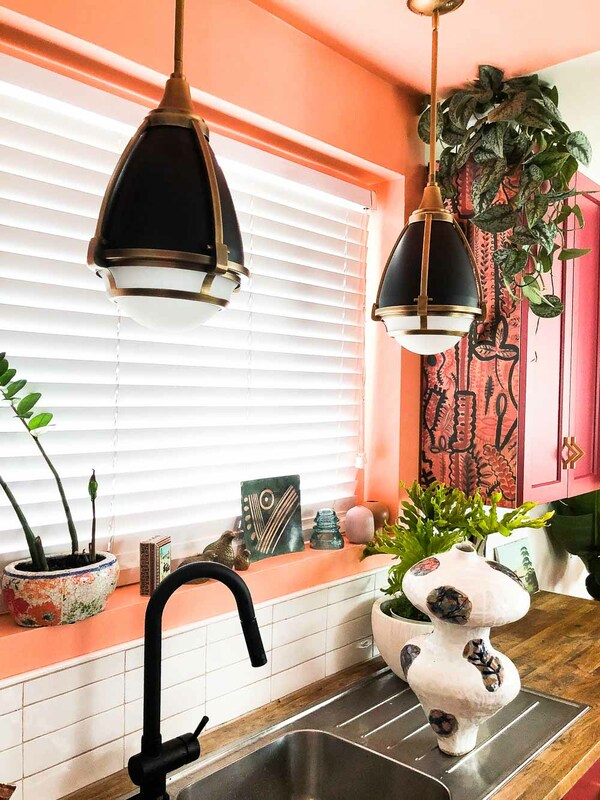 They are Kichler Ayra 10″ Wide Natural Brass Mini Pendants from Lamp Plus. 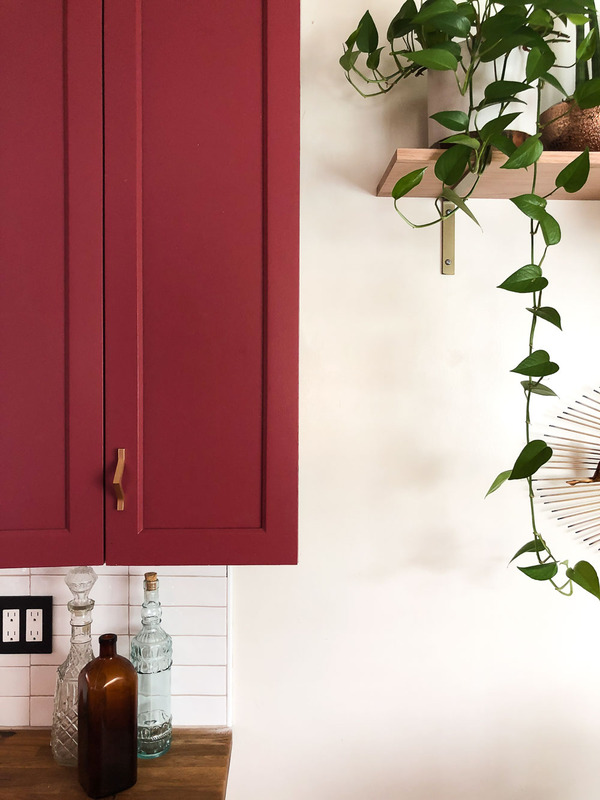 They were the first product to arrive for our kitchen renovation, and I absolutely LOVE THEM. I knew I was on the right track once I saw them hanging from our ceiling. I like the effect a lot. 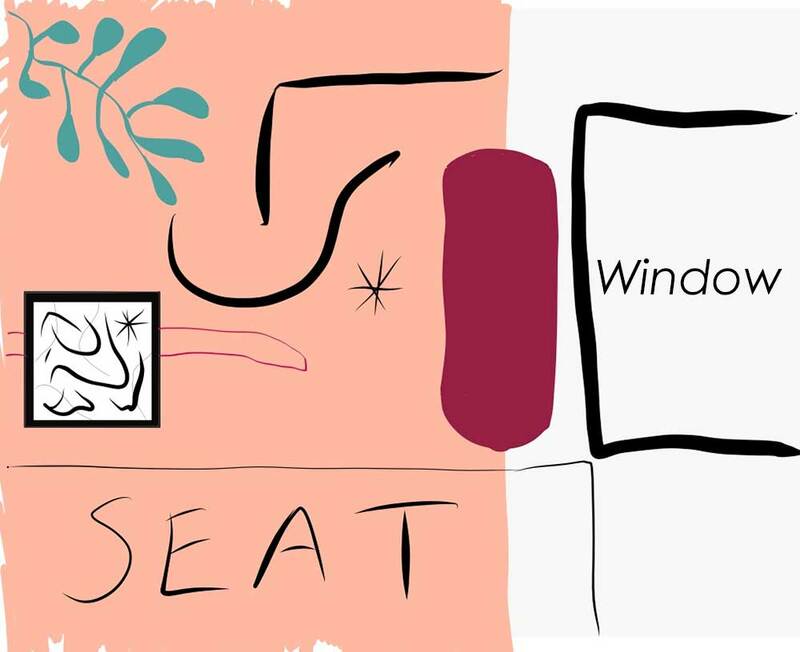 It is a “framed” window, my friends!!!! 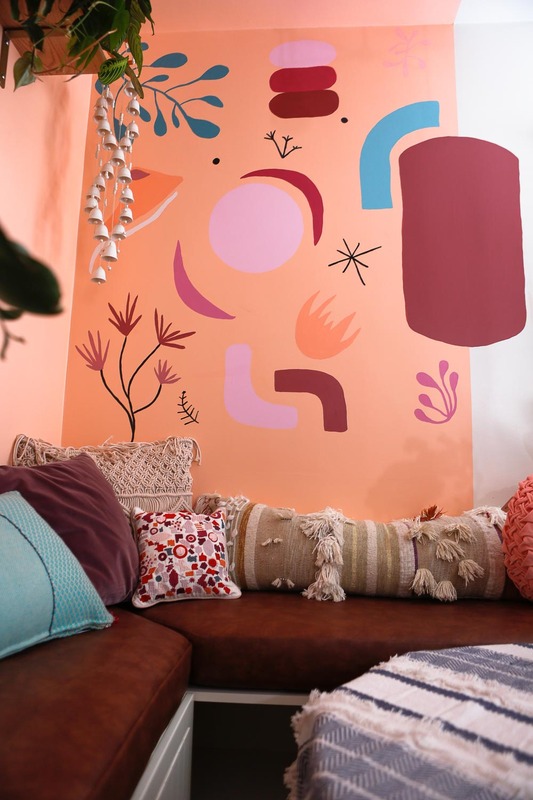 Another way of creating a fun room in a budget was painting a small mural. 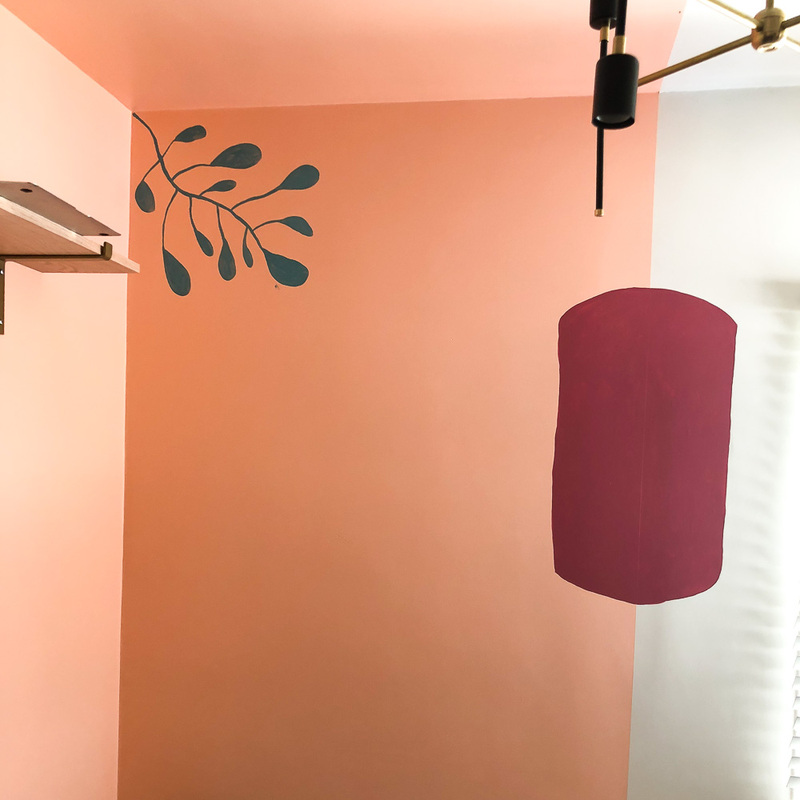 I went back and forth about how I wanted this to look, and I ended up deciding on this versione: It makes me happy to have half the wall in white and half coral. It makes the room more interesting, I think. 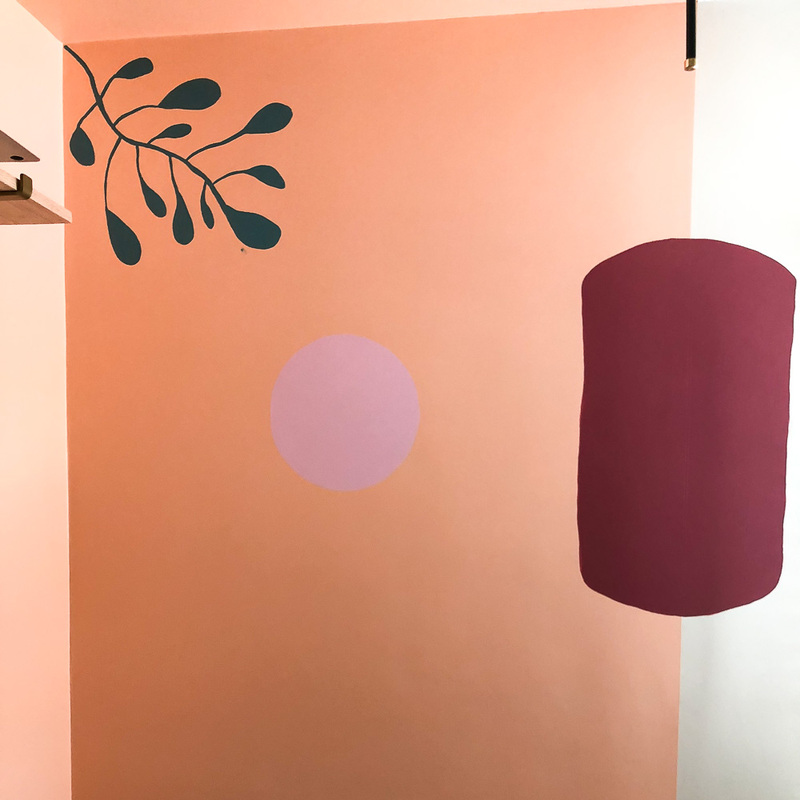 Here you can read about my initial ideas about the mural. 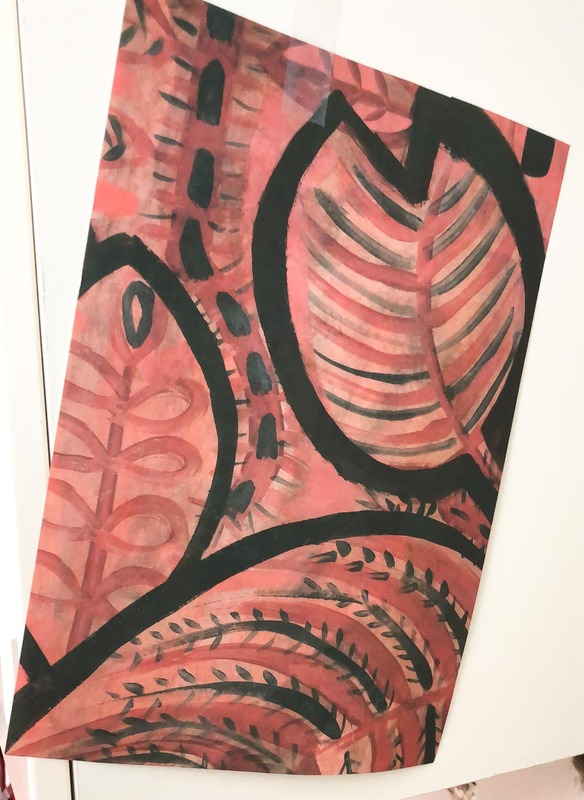 In the beginning, I wanted to have more black lines everywhere, but then, the day I painted, I had a change of heart and went with this colorful design. 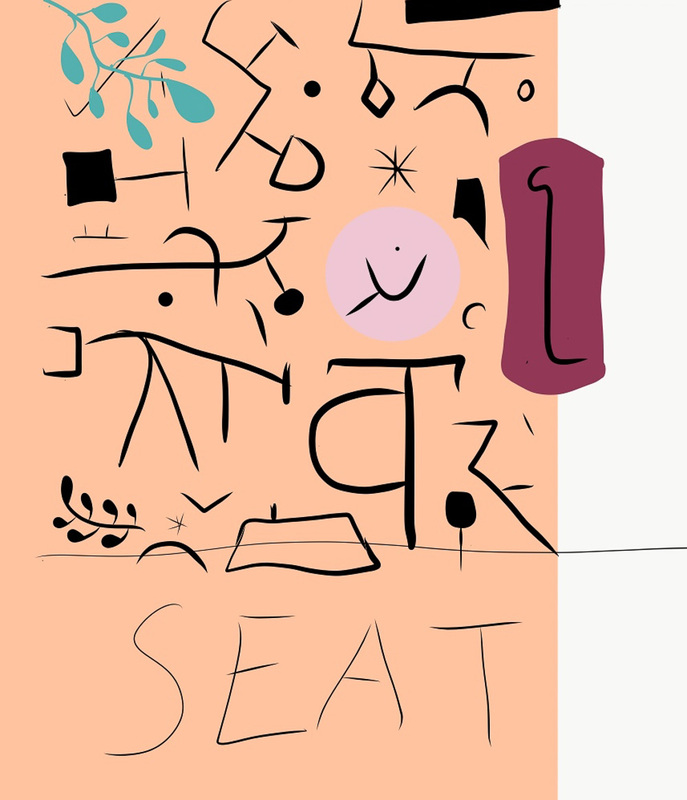 I created a sketch of what I wanted in Adobe Draw and then used a pencil to trace the initial lines into the wall. I used paint samples of wall latex paint for color and added 2-3 layers of paint for each figure. Most of the pillows are from Target but for that teal pillow that I LOVE!!!! It is from Ximena Rozo Design. 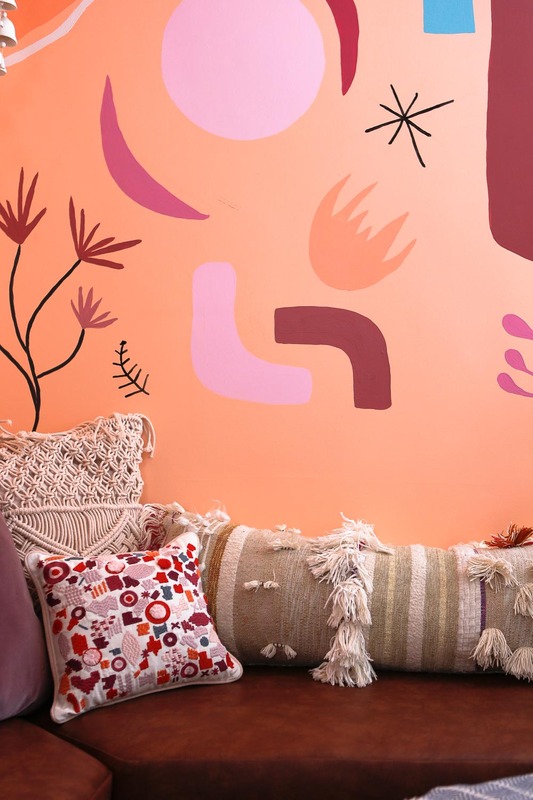 Ximena is a fellow Latina with a unique design sensibility. 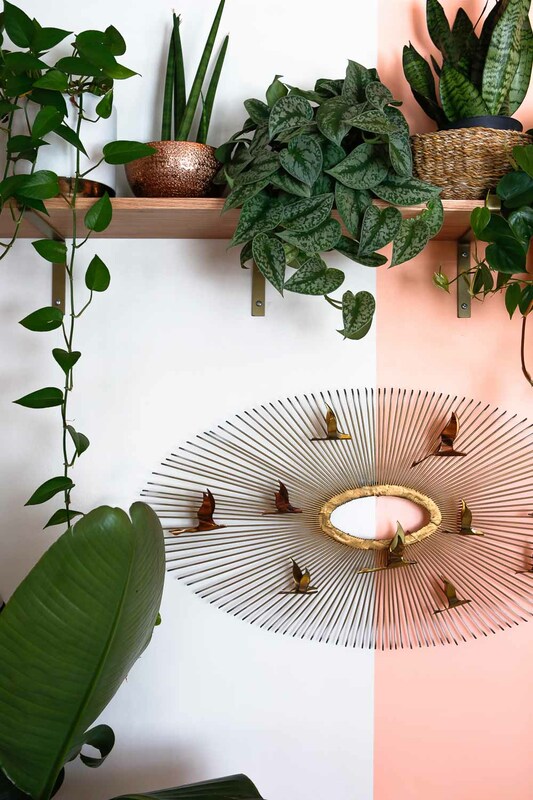 She works with artisans in Colombia to bring gorgeous and contemporary home decor to the US. What impressed me the most about this pillow was its high quality. I mean, the fabric is durable, bright, soft and sturdy. 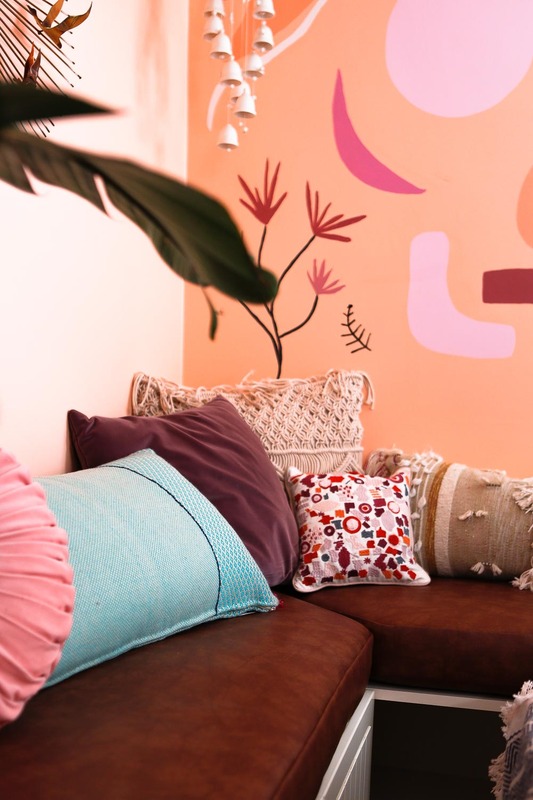 The colors that Ximena uses are also beautiful and bold. 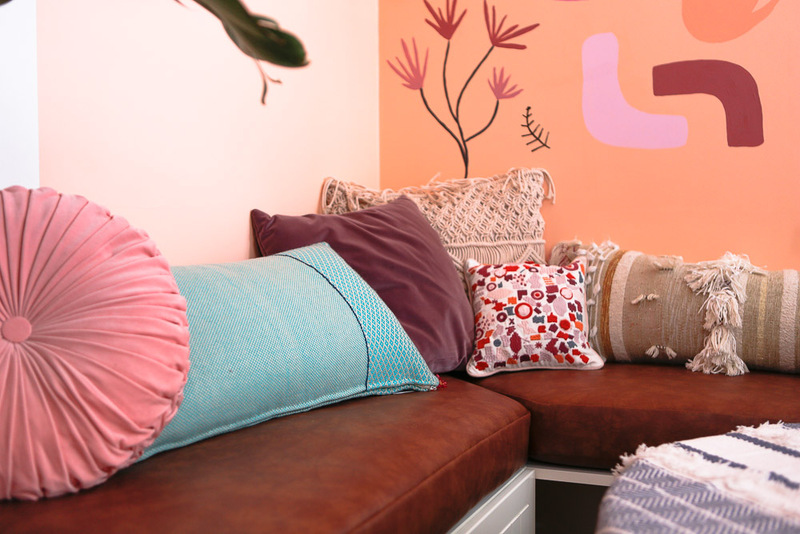 This pillow works great as contrast for this space. The lower seat cushions are vinyl and locally made. The blue and white pottery here is from Katy Krantz who has the most beautiful sculptural ceramics. I have a lot of her ceramics around my home. 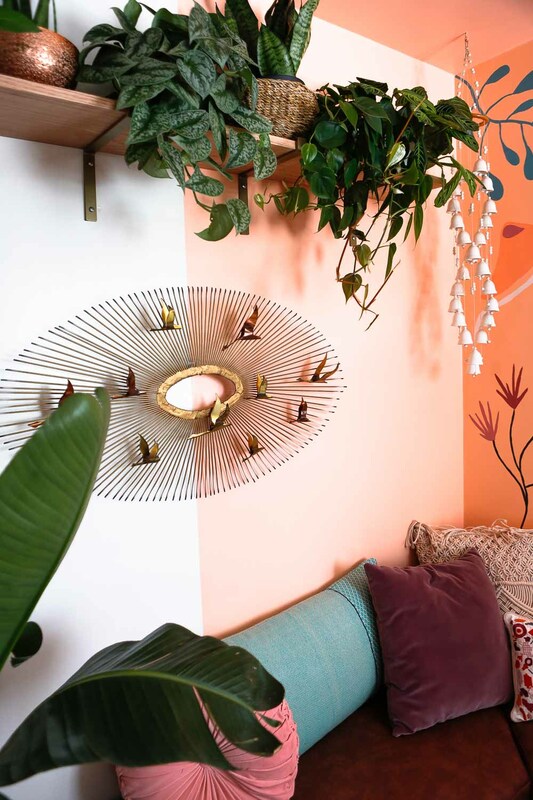 That chandelier is from Illuminate Vintage. 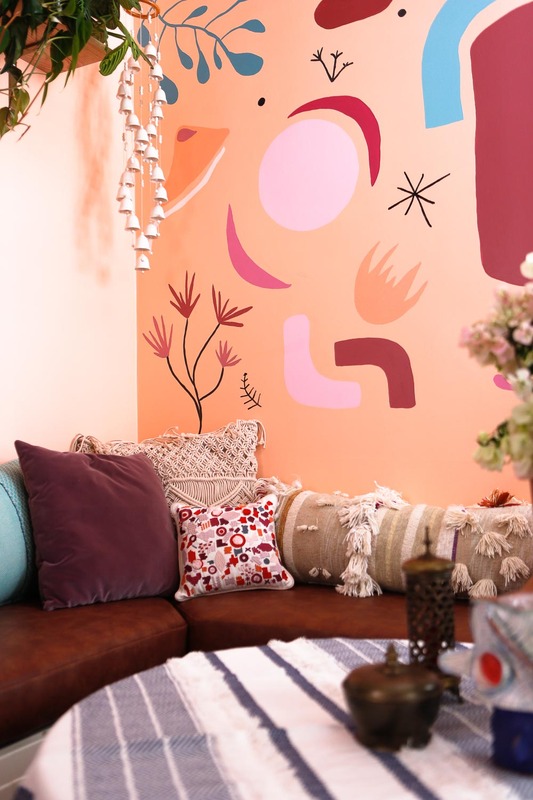 I like how it looks here and the contrast it creates between modern and boho. 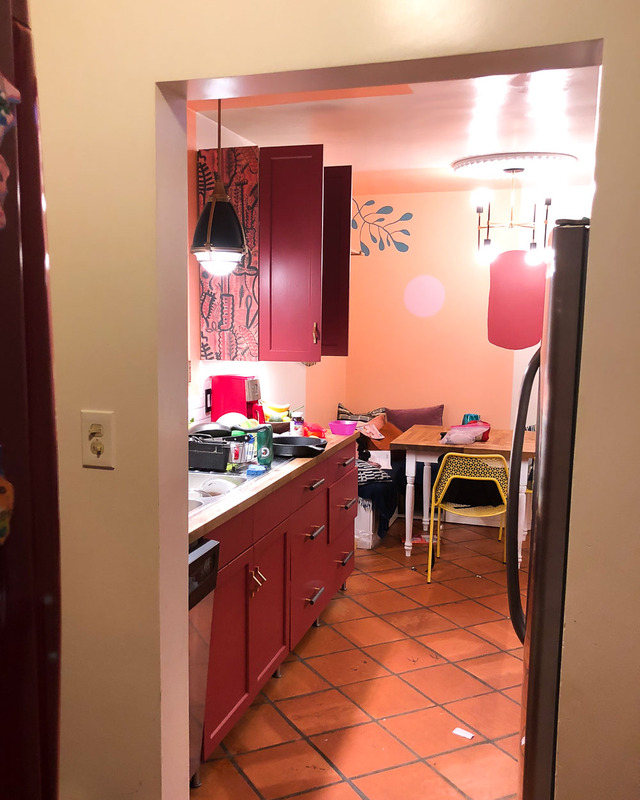 Can I just say it that I am really grateful that the Opalhouse line for Target just came out and it happened to have the same color palette of my kitchen?? It was the perfect place to get most of these pillows. That brass sculpture is from Curtis Jere. I have been eyeing it for a very long time! 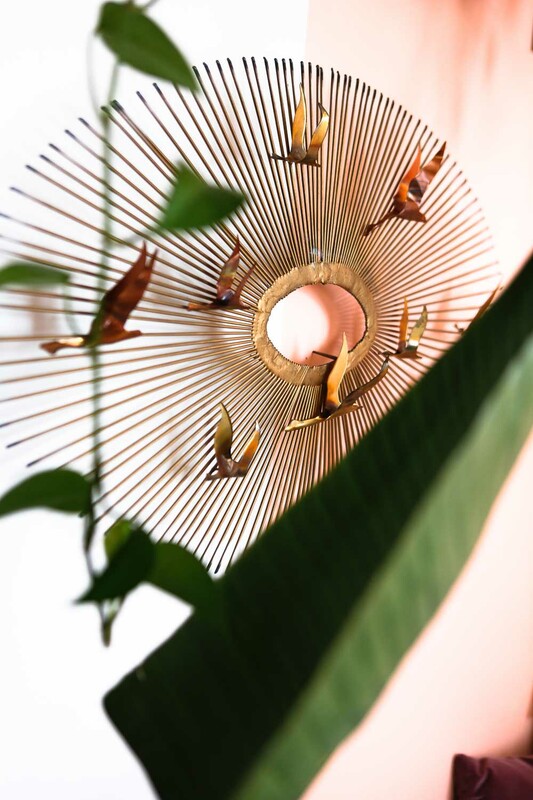 I love brass, birds, and vintage so this was the perfect piece to complement this dining area. I also like how it hangs half way in between wall colors. 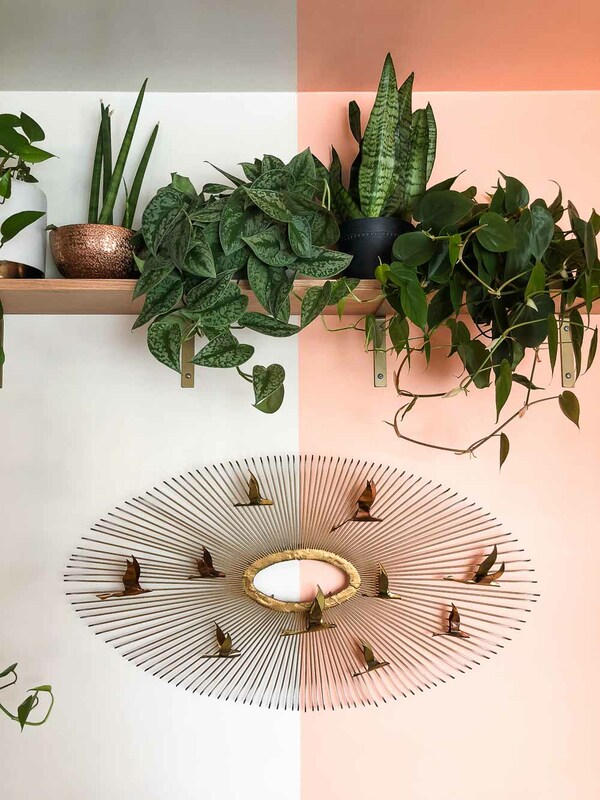 Of course, no home is complete without a bunch of plants everywhere. I decided to add one shelf to the dining room to use only for plants. I needed green and more patterns. Behind the scenes shot. 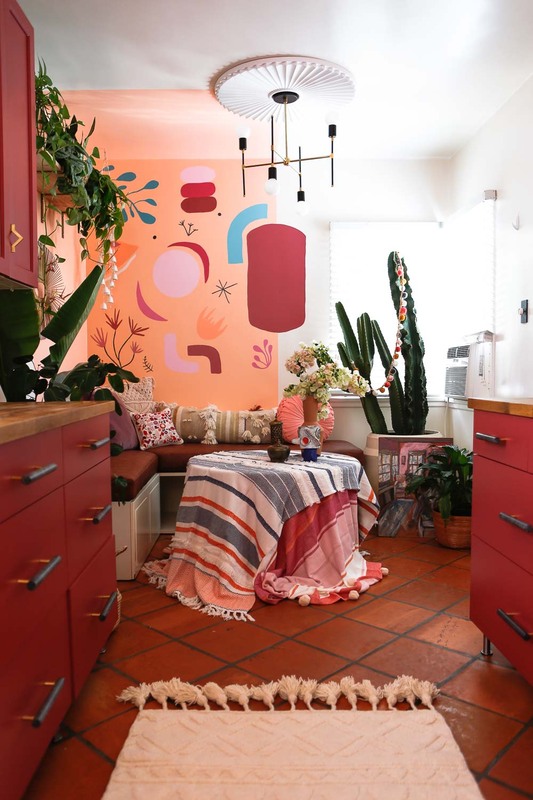 One of my favorite finds for this ORC was the wallpaper from Lucy Tiffney. This lady has lovely designs that stole my heart. 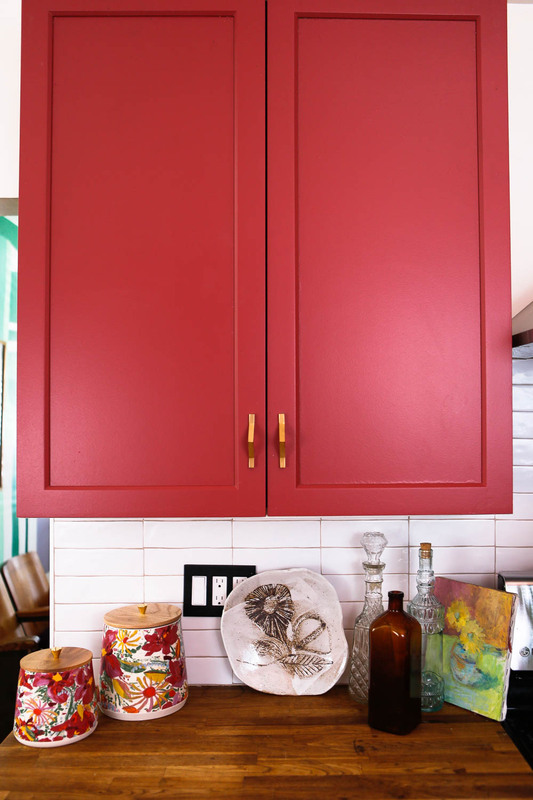 The one that I used for the side of my cabinets is called Siena. It looks great in photos AND in person. 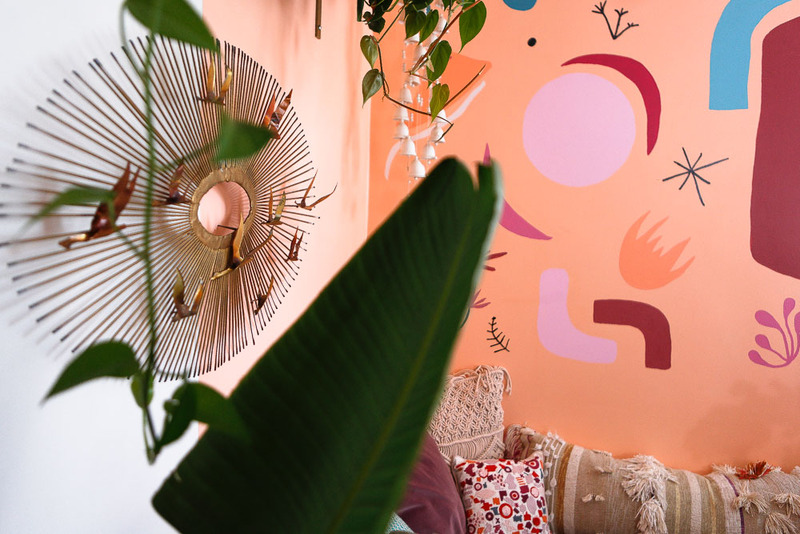 I would use every wallpaper from her shop in my home if I could… They are all colorful and fun. The runner is from Anthropologie. Choosing a runner was NOT easy. After a lot of thought and search, I decided to go with something neutral, and I don’t regret it. 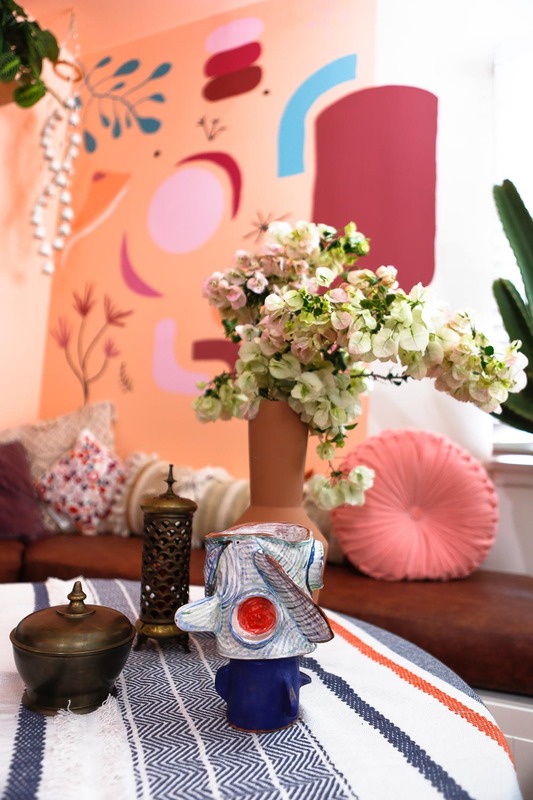 I needed to bring some brightness into the room, and this rug did it. 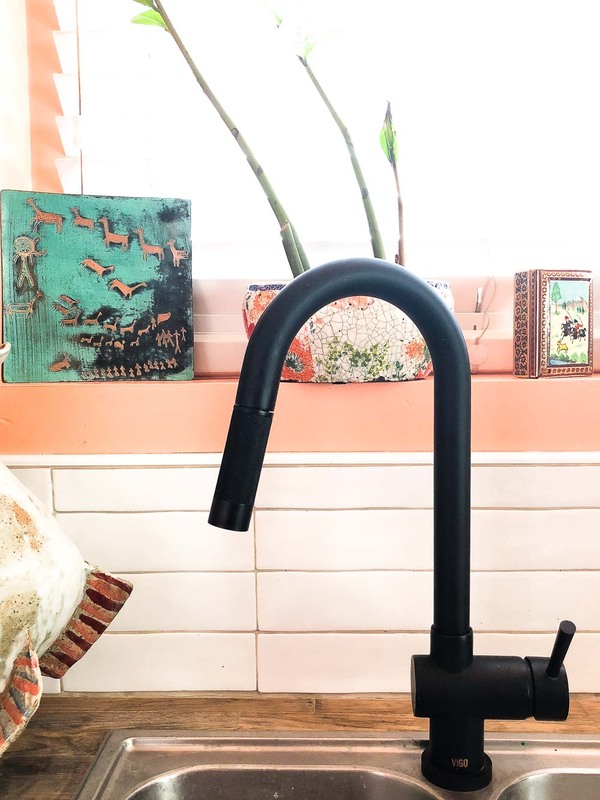 Although I didn’t have the budget to change our countertops and sink, I did replace our water fixture for this black one from Lowe’s, and I have to say… I like it. 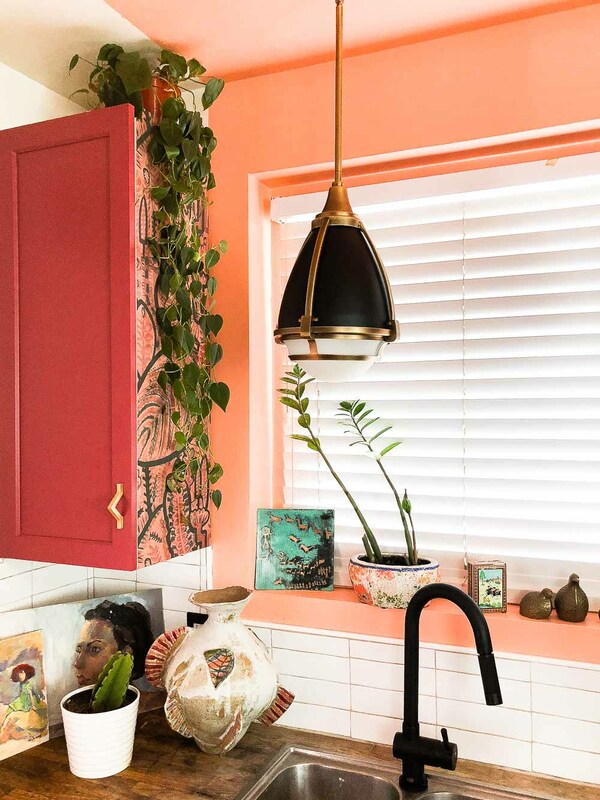 It is sleek and gives the space an air of sophistication that it wouldn’t have had with the ugly and old silver water fixture. The new cabinet handles are from CB2. 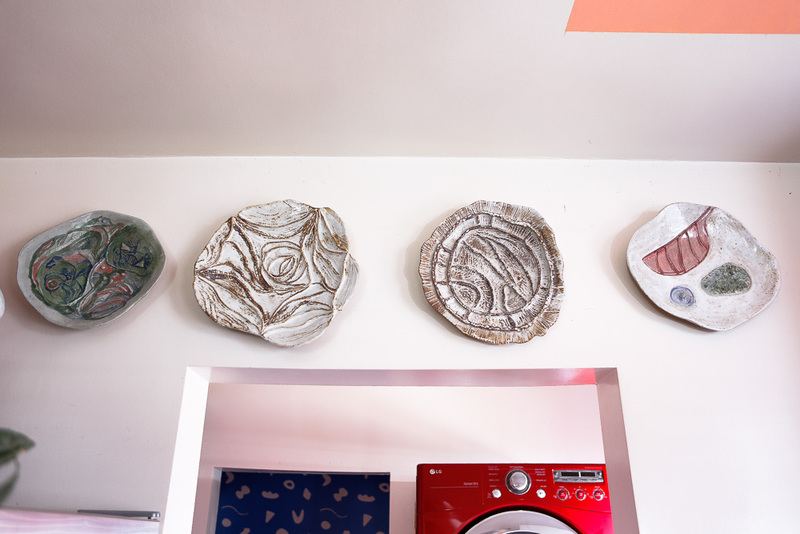 These gorgeous plates are also from Katy Krantz. I enjoy having pieces in my home that are unique. 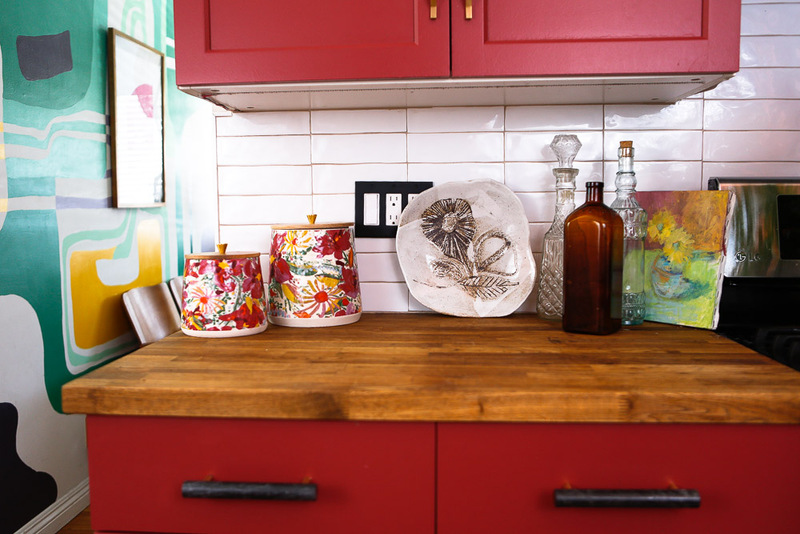 These plates make our kitchen a lot more interesting, don’t you think? Me having a much-needed rest after these five weeks of craziness. 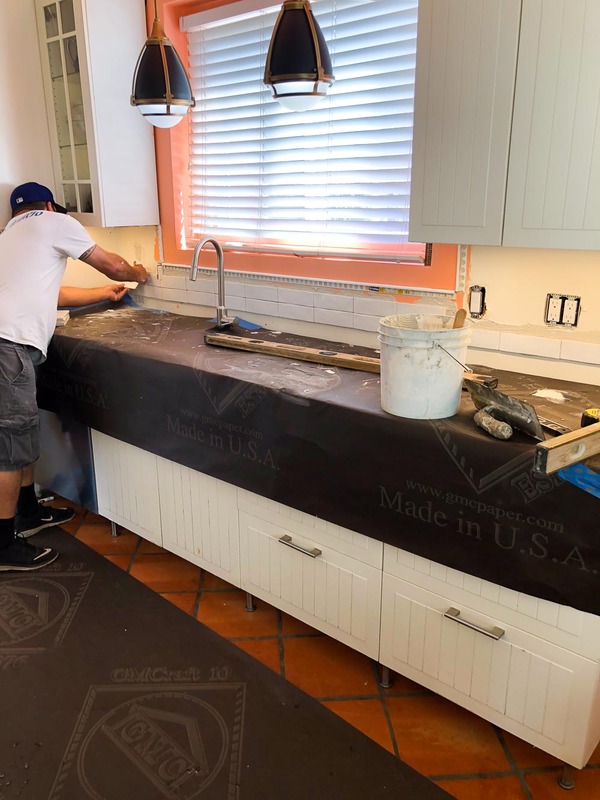 Change countertops to a better quality wood or cool terrazzo. 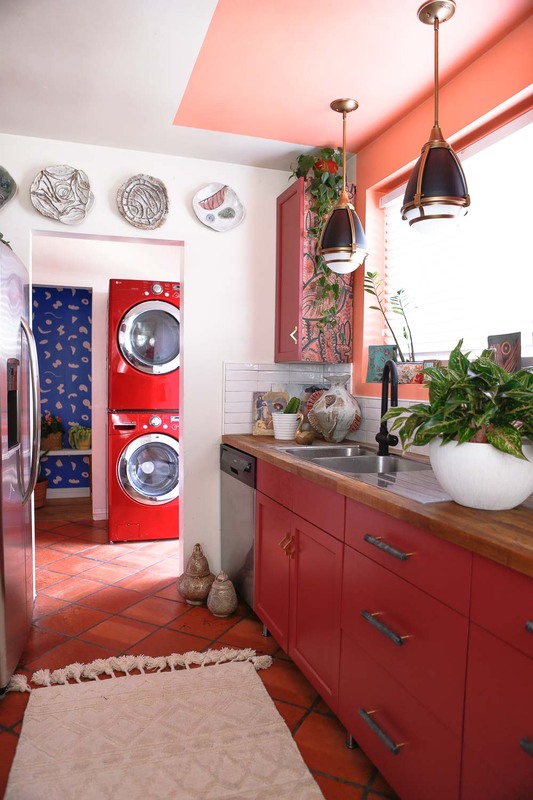 Change the sink to a white large farm sink. 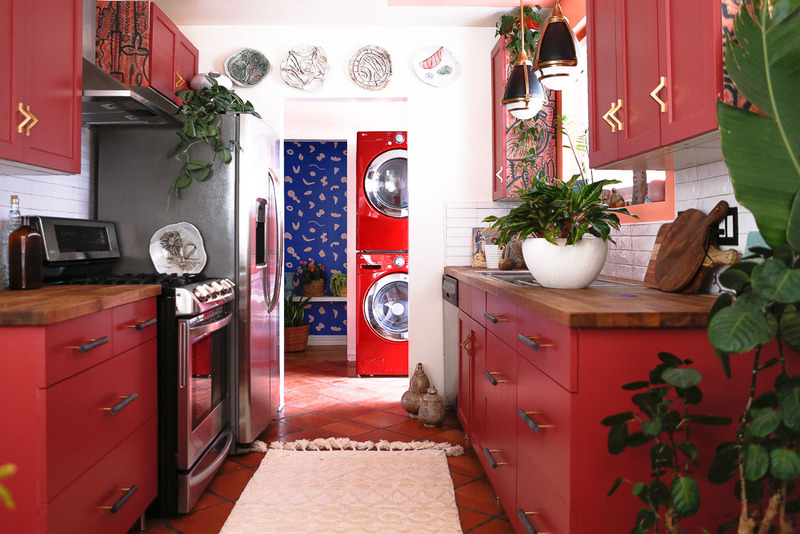 Change the floor tiles to a lighter Moroccan style tile. Hire a professional photographer to help me with the pictures. Overall I am VERY happy with how our kitchen looks right now. It is different, unique, fun, and something I am proud of. 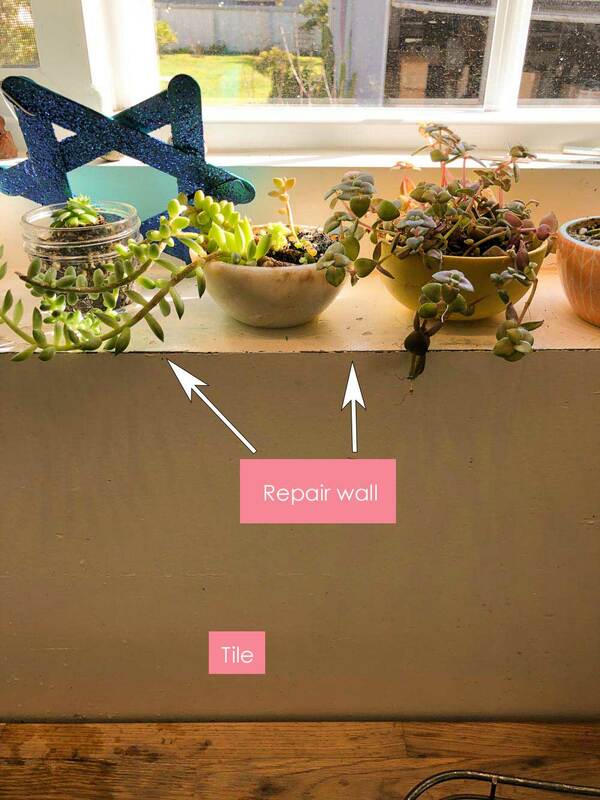 I want to thank my husband (who will never read this post) for spending hours as my handyman. I am amazed at his talent and capacity to work. 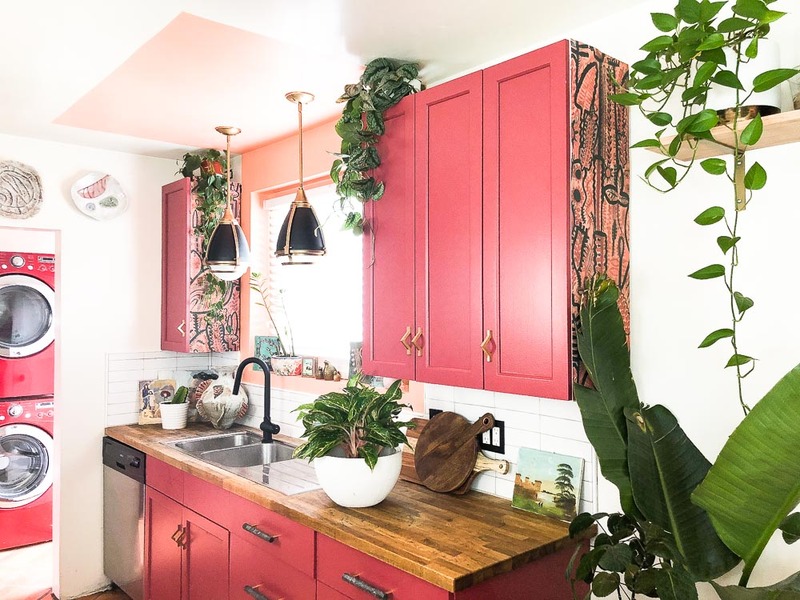 I also want to thank my friend Lindsay that let me raid her home to help me style this kitchen. Now, I am just happy to be done and to be able to focus on this child I am having in a month. Thanks for stopping by and let me know any comments or suggestions you have for future challenges. I know it is crazy to even talk about this right now, but I really need to tackle our master bedroom and the patio… ha! I am insane. *This post was sponsored by Lamp Plus and Cabinet Door Mart but all opinions are my own. Thanks for supporting the brands that make Jest Cafe possible. I need your help this week. 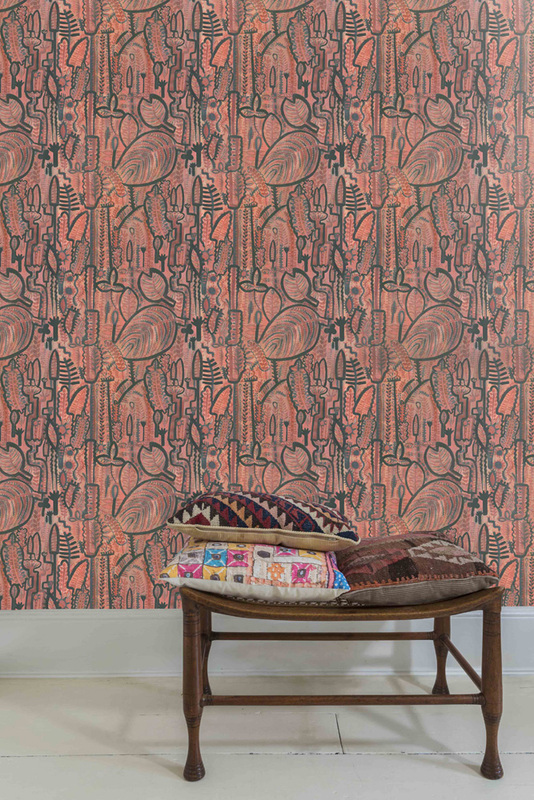 I have found the most beautiful wallpaper from Lucy Tiffney called Siena to use on the side of the kitchen cabinets. Our cabinets are laminated, so they are challenging to paint, this is why I decided to use wallpaper to cover the white sides. Here is the result: I genuinely LOVE the wallpaper so much. I mean, it is just gorgeous. 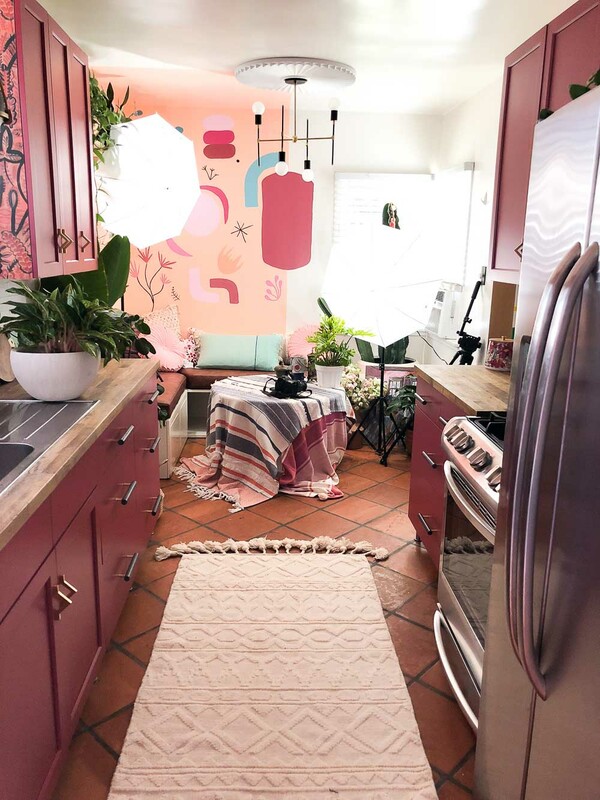 Lucy has real talent, and all her wallpapers are amazing, BUT, I am not sure if they are the best solution for my kitchen. Let’s see another POV: In the background, you can see how I started painting a mural. When I am done, It will have a lot of lines that might clash with the wallpaper. 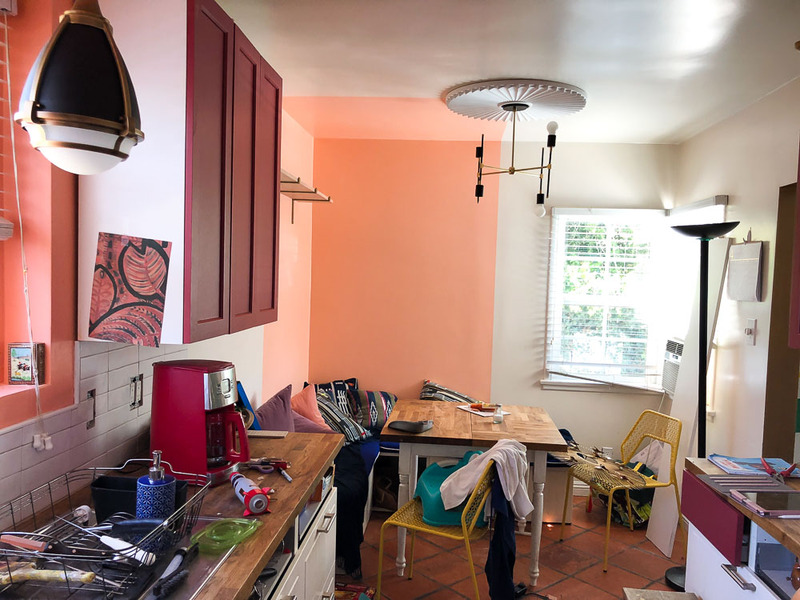 Here is what I have in mind: So, the problem is: should I paint the side of the cabinets or should I keep the wallpaper? 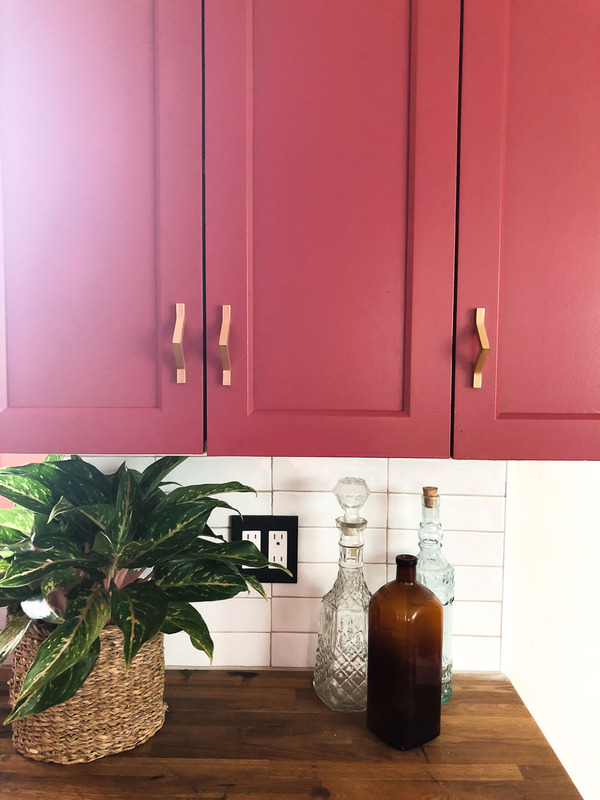 I painted the side of the bottom cabinets already. Here is the result: They don’t look bad! Do they? Thoughts? I NEED YOUR HELP! Please, leave a comment with your thoughts because I don’t know what to do here. 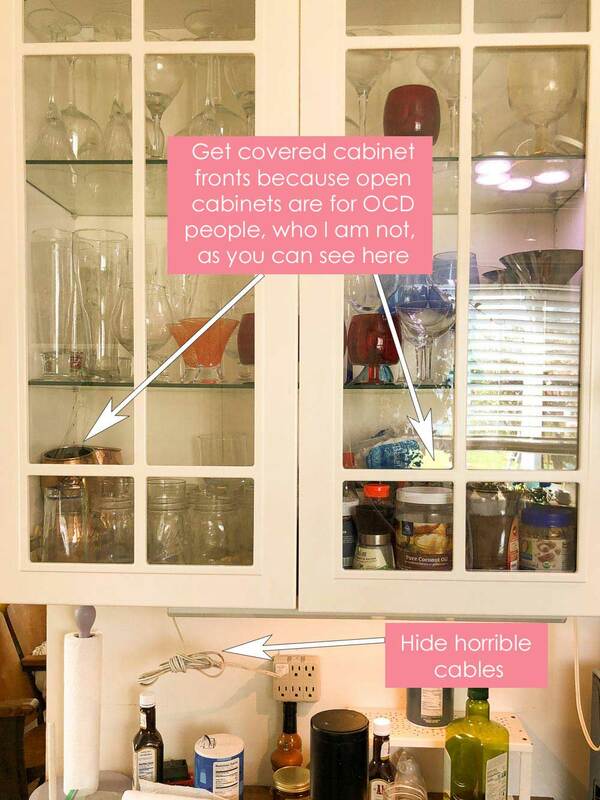 Clean the surface of your furniture/cabinets. Lightly sand the surface of the cabinets. Make sure the shine is gone but don’t sand too much that you go through the lamina. Wipe the surface of the cabinets to take out the dust from sanding. 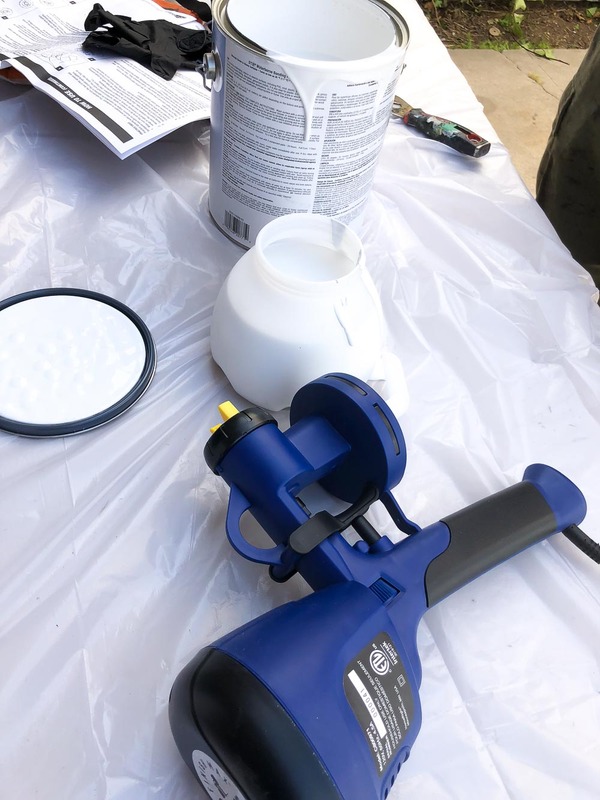 Apply a good oil primer. 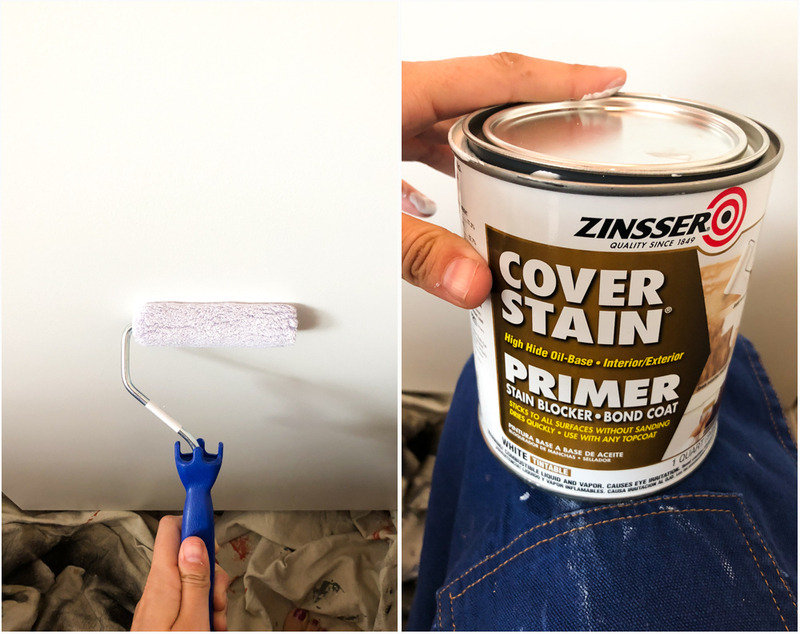 This primer will stick to the laminated surface better than a latex primer. Let it dry. Apply two or three coats of paint. 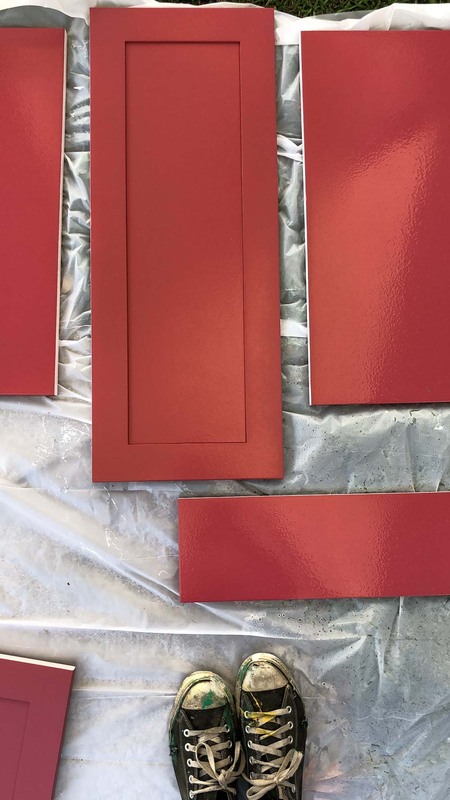 Our cabinets needed three coats. I created the inspiration drawing above in Adobe Draw. I LOVE that app. It has been such a great way of coming up with ideas for this ORC and also other projects that I have going on (more on that later). 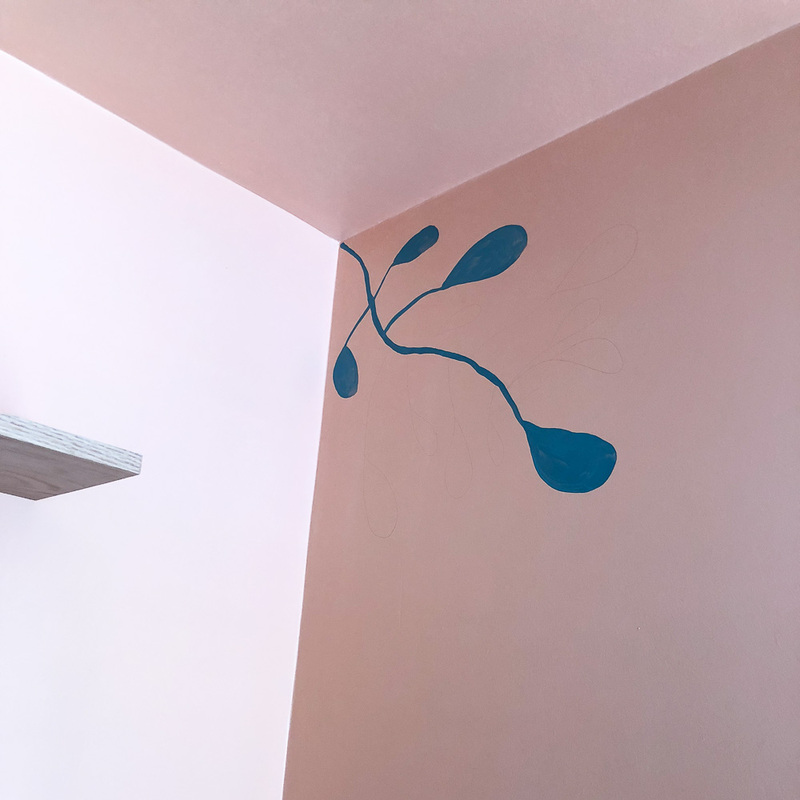 The mural is simple enough that I used a pencil to draw it on the wall and painted from there. 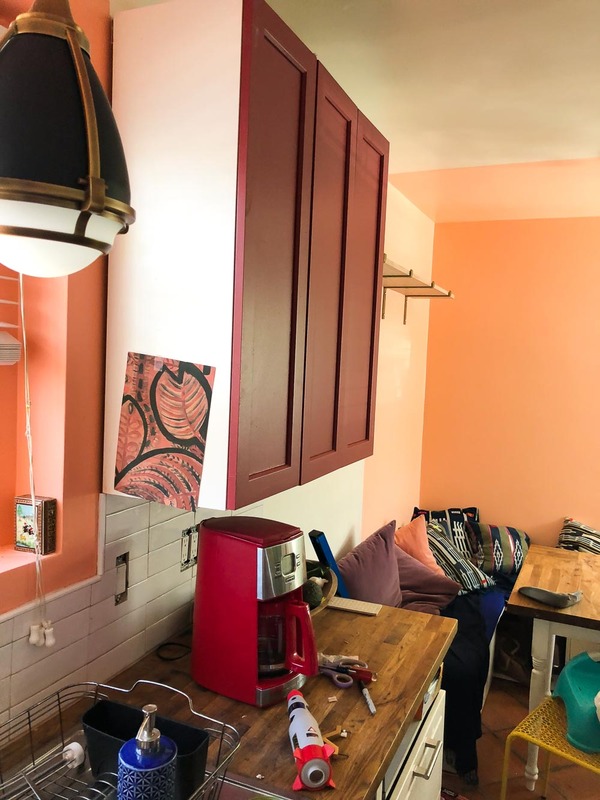 Paint side of the cabinets? 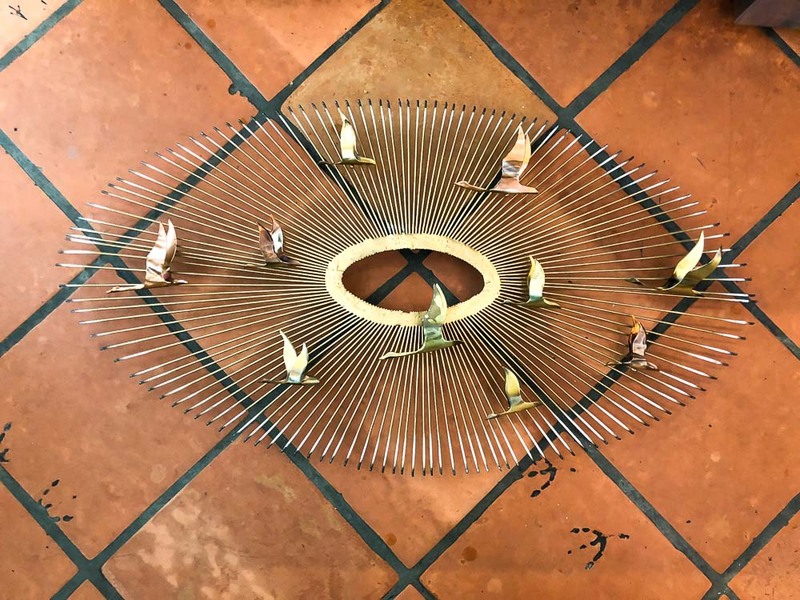 Here are some more photos of what we have done so far: I super like this sculpture by Curtis Jere… It gives the kitchen a fancy feeling. Black switch plates. Somebody in IG recommended that I go to Rejuvenation to get cute lighting plates and, although I wanted something more fun and eye-catching, these black plates are l cute and less busy. I love them. I also love how the ceiling medallion looks on top of the chandelier. I wish I had a more prominent light fixture here, but I don’t have money to get what I wanted. This is a gorgeous compromise, don’t you think? I can’t wait to see how the new cushions look in that breakfast nook. I have a good feeling about this! And, don’t miss the reveal next week. Also, don’t forget to let me know what do you think about the wallpaper v/s paint situation!! 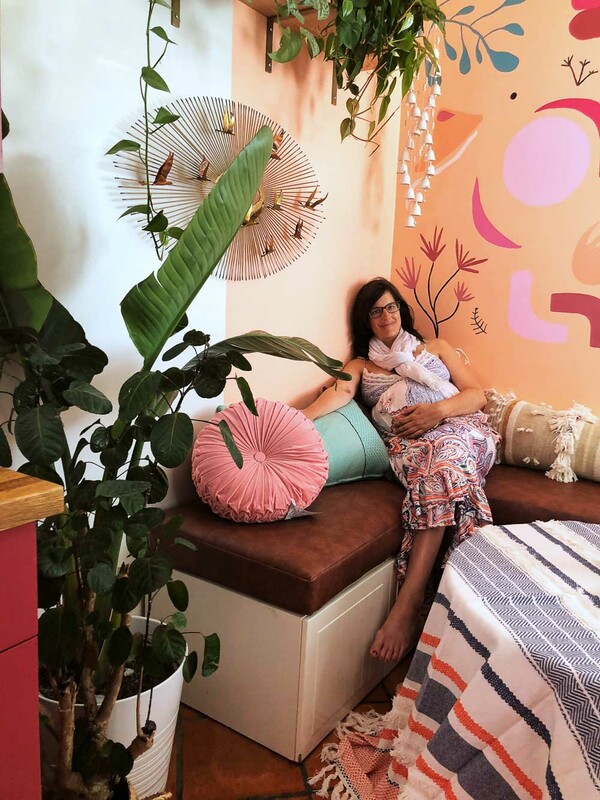 Some of you have asked me: “How can you be so INSANE as to participate in the One Room Challenge when you are 7 MONTHS PREGNANT!! !” Well, I will tell you. 6 years ago, George and I bought our home and decided to use IKEA kitchen cabinets for our kitchen. 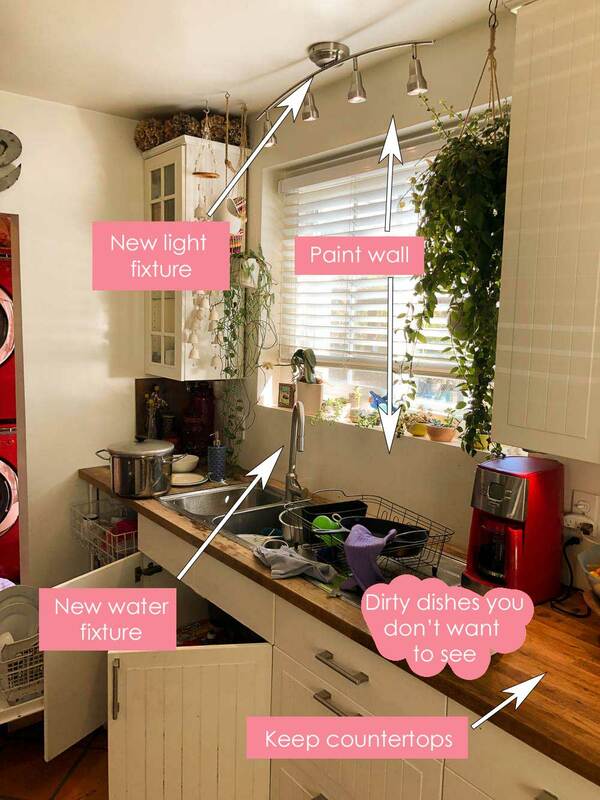 As much as I love IKEA and its aesthetics, I don’t like the quality of all its products. Anybody else in agreement out there? 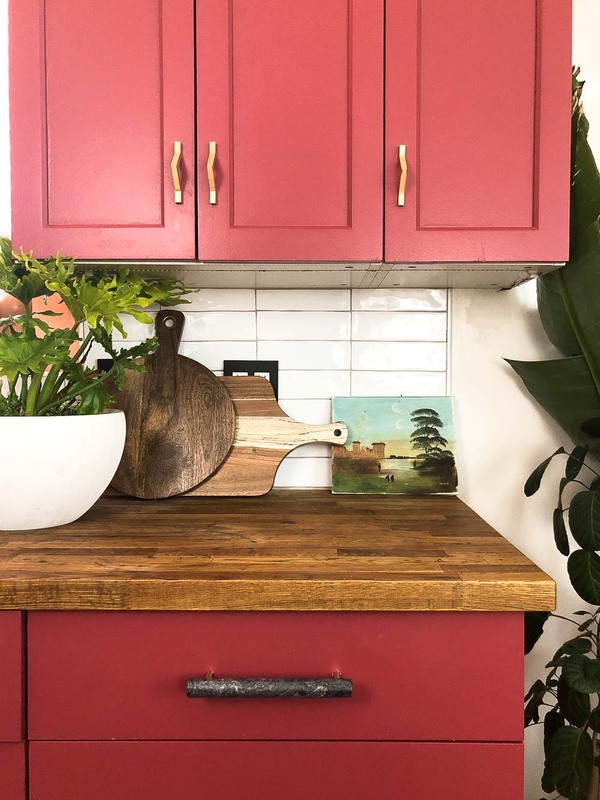 Well, within six months our kitchen cabinet doors were deteriorating, and within a couple of years, they were in a pretty sad state. 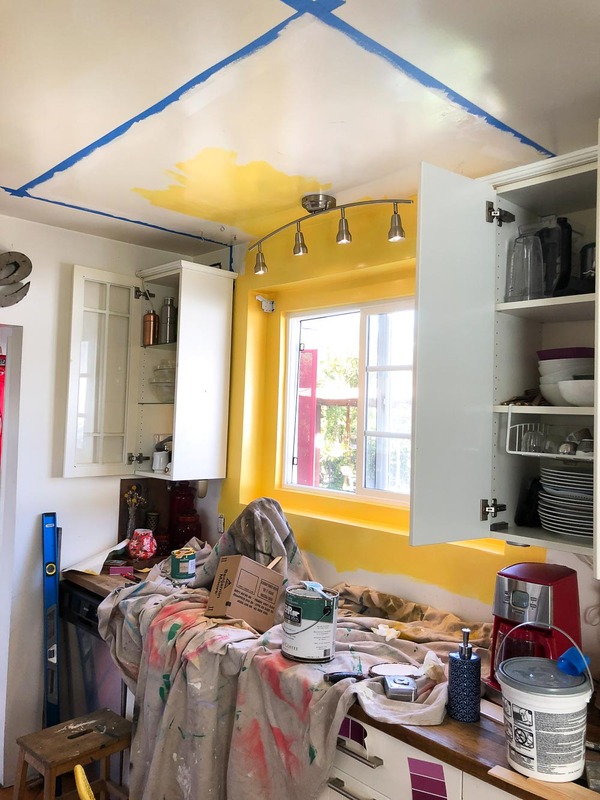 George painted white all the imperfections as a temporary solution, but the truth still remained: my kitchen cabinets looked like crap, and it was intensely annoying!!!! Well, some months ago I was approached by Cabinet Door Mart. They mentioned they would like to work with me on an upcoming blog project and my kitchen soul got REALLY excited!!!! Sometimes, opportunities fall on your lap, and you have to take them, no matter that a child is growing in your belly at lighting speed! This was my ONE AND ONLY OPPORTUNITY to get rid of those horrible IKEA cabinet fronts and replace them with good quality doors!!!!!! I took the opportunity, people, and I haven’t looked back yet. 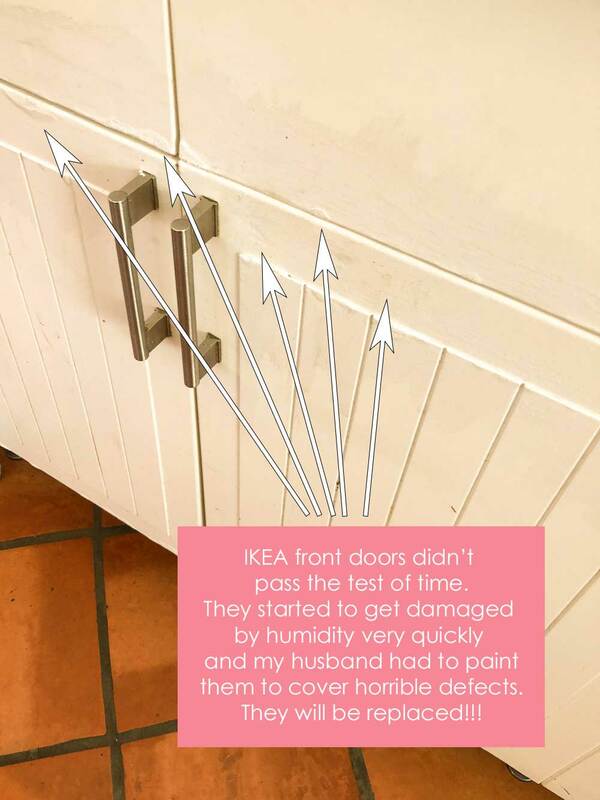 This is the thing: replacing IKEA cabinet doors and drawer fronts is NOT easy. The measurements of the furniture I bought six years ago don’t exist anymore! 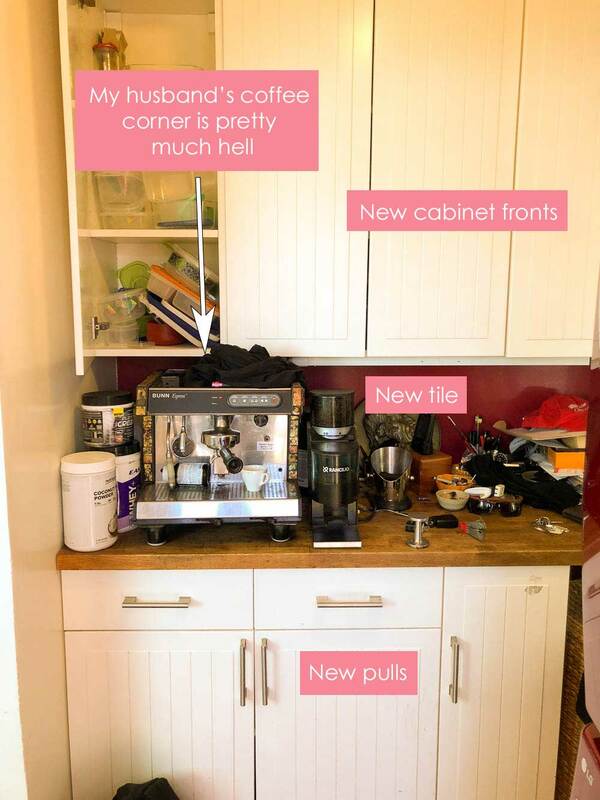 And there was no way I was going to replace all my cabinets, much less using more IKEA doors and fronts to have them all fall apart because of humidity in less than a year. 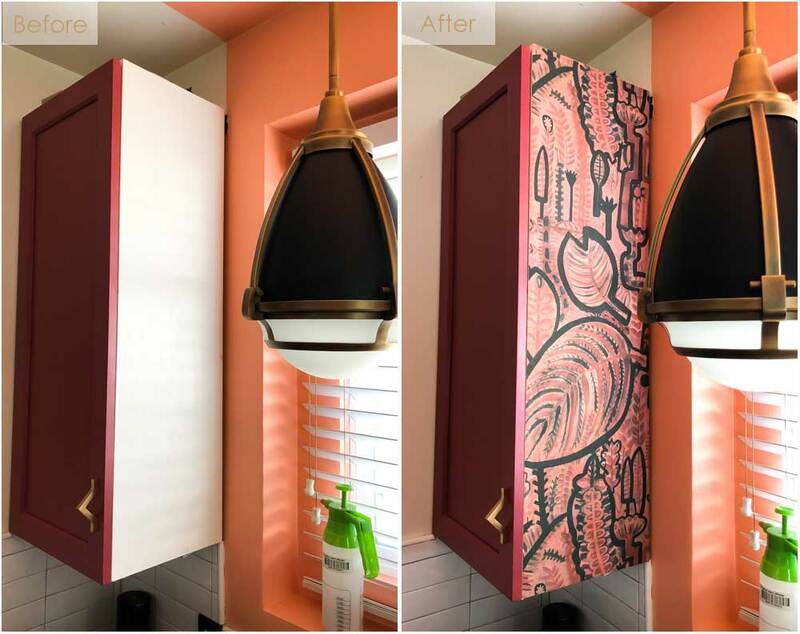 I just needed a “facelift” not a full-on plastic surgery, so Cabinet Door Mart came to the rescue. Good news is that this company will customize doors and fronts to whatever size you need. You have to round up your door sizes to the next 1/16 of an inch. I measured all my cabinets, sent a list of what I needed, and got all my new doors and fronts in no time, nothing short of a miracle. Customer service = excellent. All doors and fronts came in natural wood. 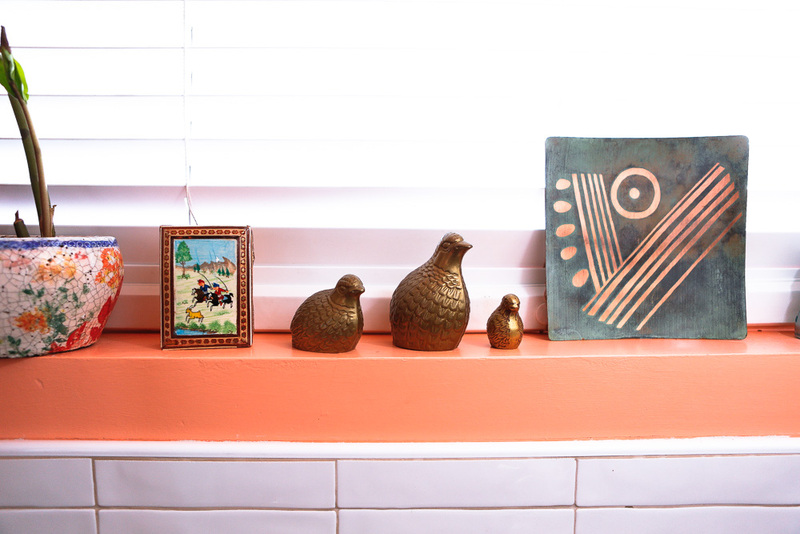 We decided to paint them ourselves in the Radicchio color by Farrow & Ball. 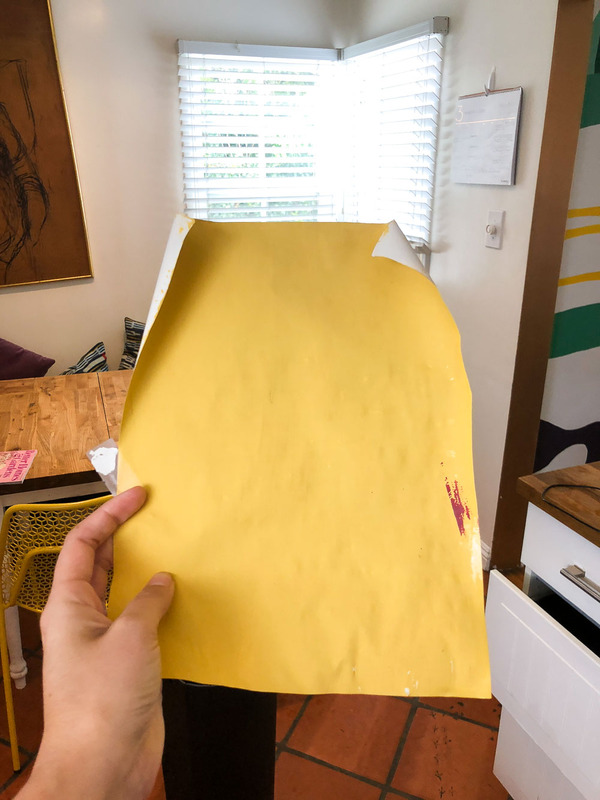 The only thing is that, as much as I love European anything, I am not about to spend hundreds of dollar in a gallon of paint, so I asked my local paint store to match the color in Benjamin Moore paints. I ordered satin finish. 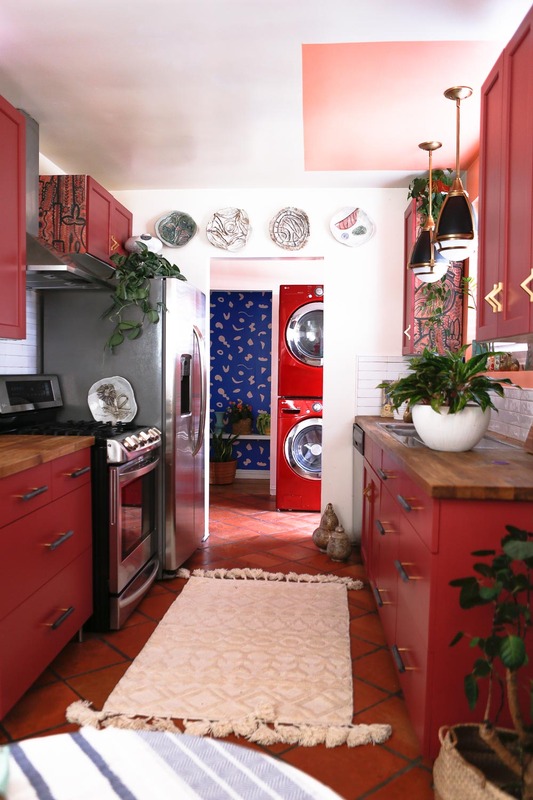 I did not want the typical semi-gloss kitchen finish, what can I say, I am not always a fan of shiny kitchens. 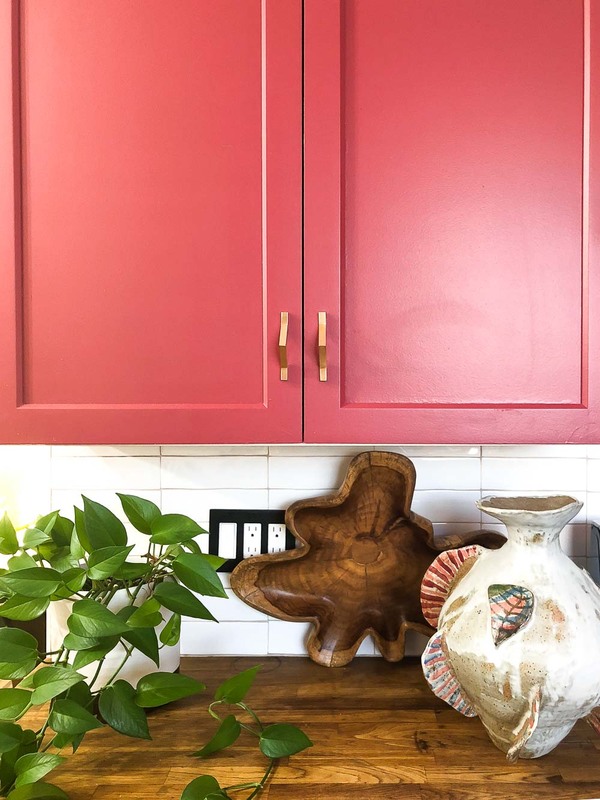 The idea behind using glossy paint in a kitchen is that it is easy to wipe, but satin is an excellent finish for that purpose, too, so that is what we used. 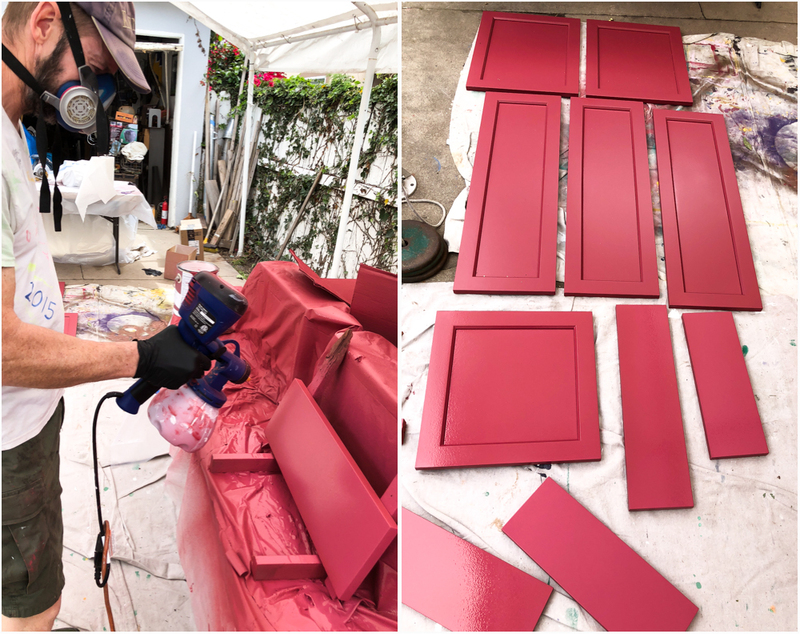 After receiving the doors and fronts, George and I started painting. 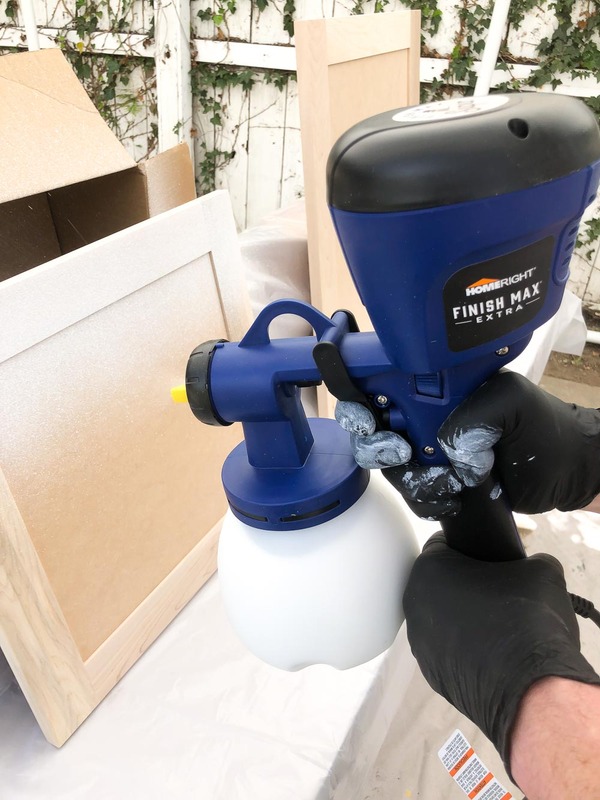 Luckily, we had an excellent HVLP paint sprayer to help with the task: the Super Finish Max Extra by Home Right. Last year, when I went to the Haven Conference, there was a booth from Home Right showing the versatility of this product. I fell in love with it because even me, an inexperienced spray painter, was able to make a paint job look perfect!!! I begged them to send me a Super Finish Max Extra, I even cried a little, and they were kind enough to say yes!!!! Now, I am not going to lie. 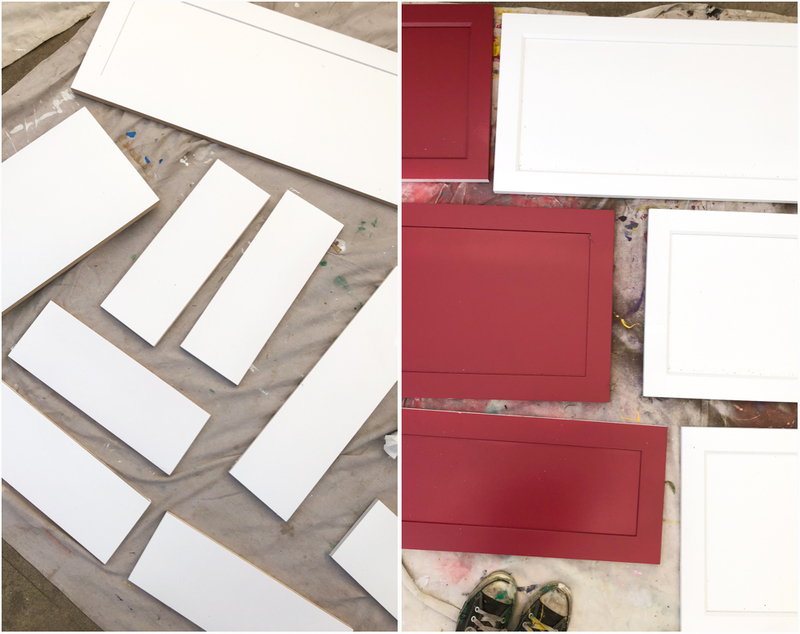 Although the Super Finish Max Extra makes your life a lot easier, painting 31 cabinet doors and drawer fronts is not a stroll in the park. It took all weekend to finish this project, mainly because we had to wait for the paint to dry before applying a new coat. 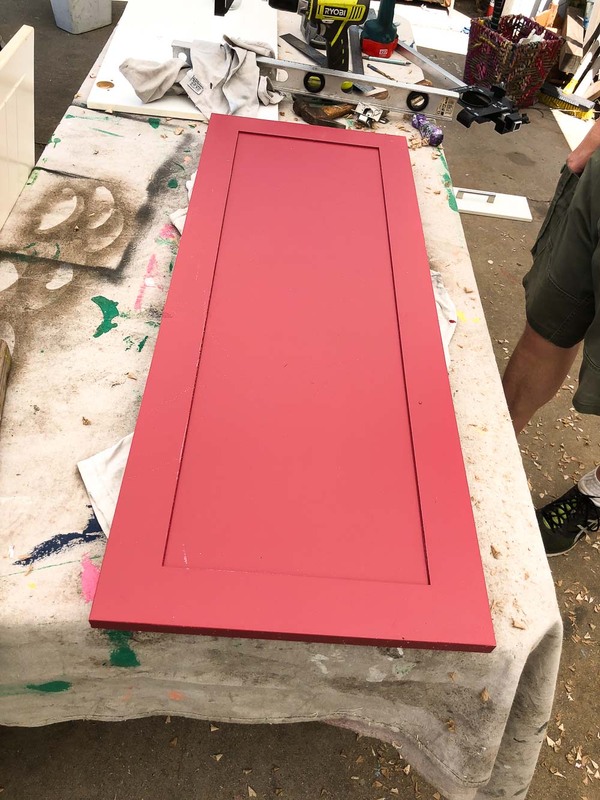 Also, you need to be SUPER careful handling all the doors, so you don’t touch the fresh paint and ruin the whole job, but look at the result! I mean, the color is just perfect. I love it all and I am thrilled to have doors and fronts that are of good quality! Another problem sweet thing that happened was that Max decided to help. 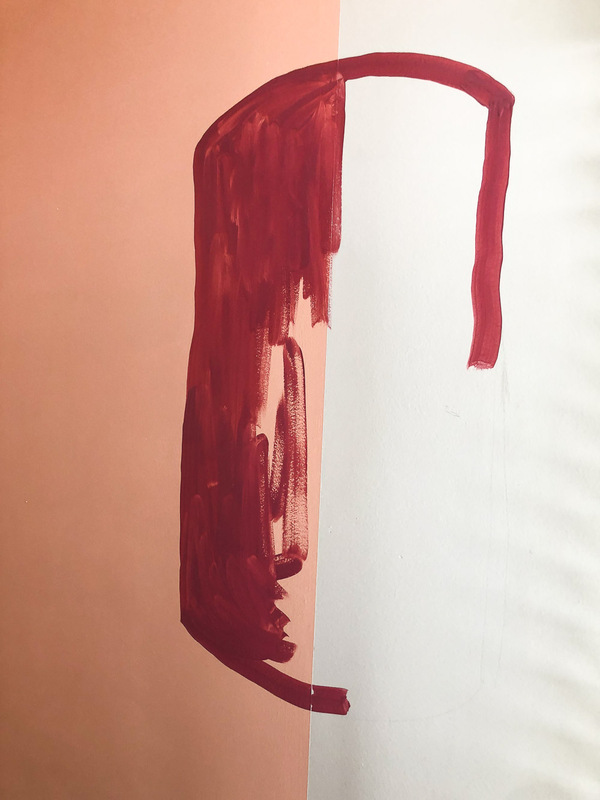 We want to be encouraging parents that teach their children to be independent and do projects, but, let me tell you, I would rather not have to deal with a four-year-old while painting 31 cabinets!!! Augh! 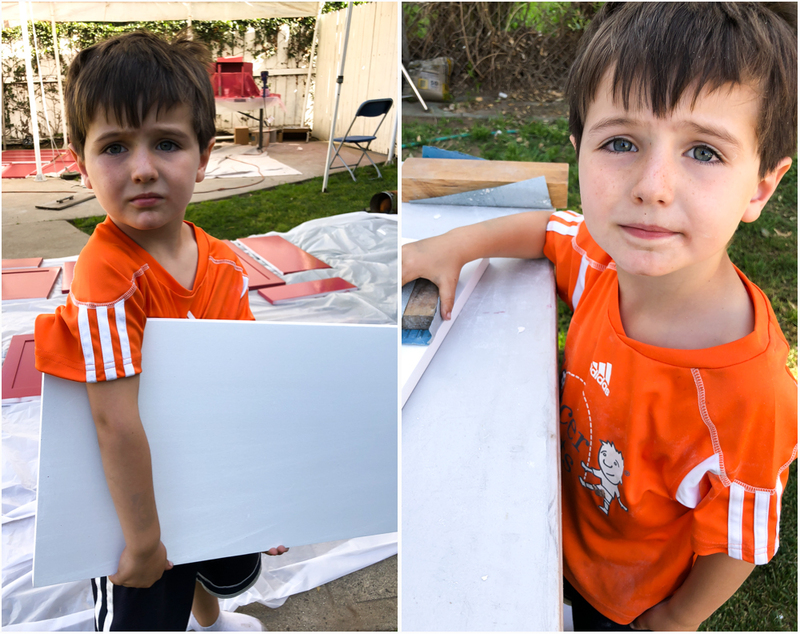 But then, look at that sweet face… oh well, he helped, and things worked out fine in the end. After painting, we had to drill cup hinges for the cabinets. Cabinet Door Mart can send pre-bore doors, but, because we had IKEA cabinets and were not sure of the measurements, we decided to do this ourselves. Again, not an easy project. The truth is that for this, I didn’t do much, it was all George, and he made it work beautifully. 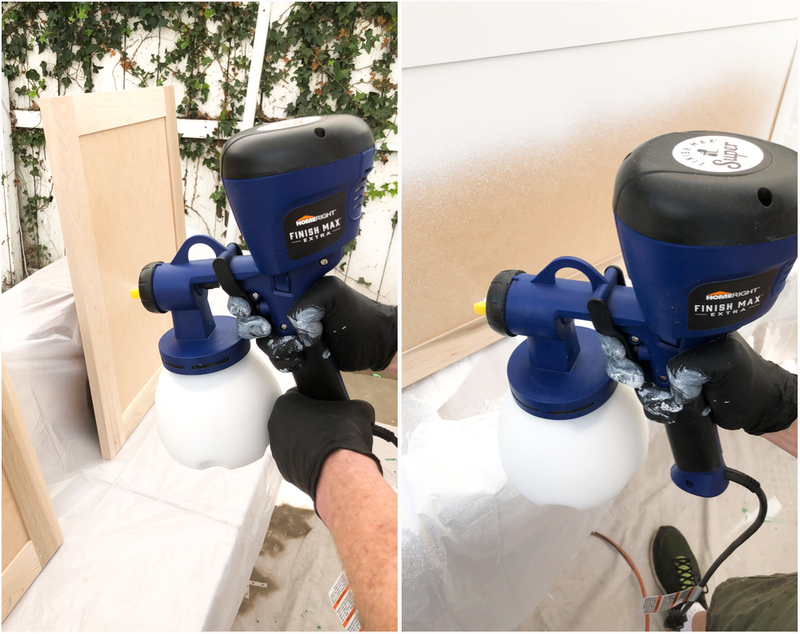 I got the Rockler Jig-It Deluxe Concealed Hinge Drilling System to help with the task, but it was a little bit of a disappointment. Not only the rail wasn’t long enough for our 39″ cabinets, but the Jig mounting holes were not aligning right. 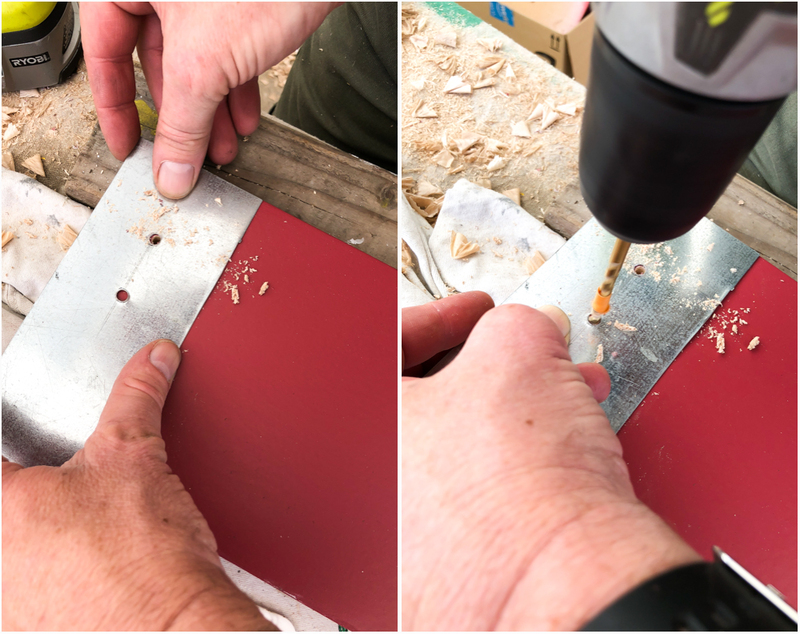 Of course, George was able to fix the issue by using different screws and other tricks, but, if you are not handy or have a good handy person around, I wouldn’t recommend drilling the cup hinges of your cabinets yourself. 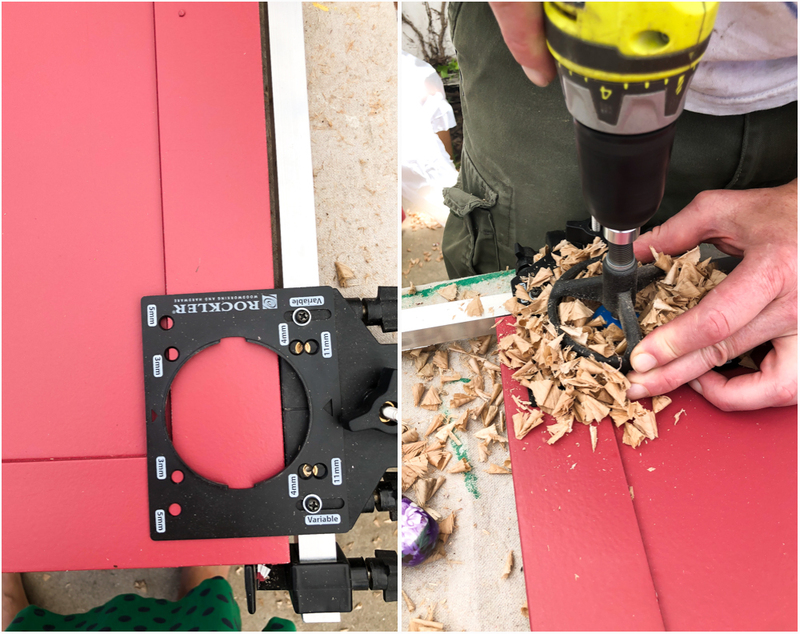 In any case, if you decide to go this route, find a better system than the Rockler we used. Look at my hubby’s invention to drill holes at a consistent width. He is soooo good. This is how the first drawer front looked like: I LOVED IT!!!!! The color stole my heart. 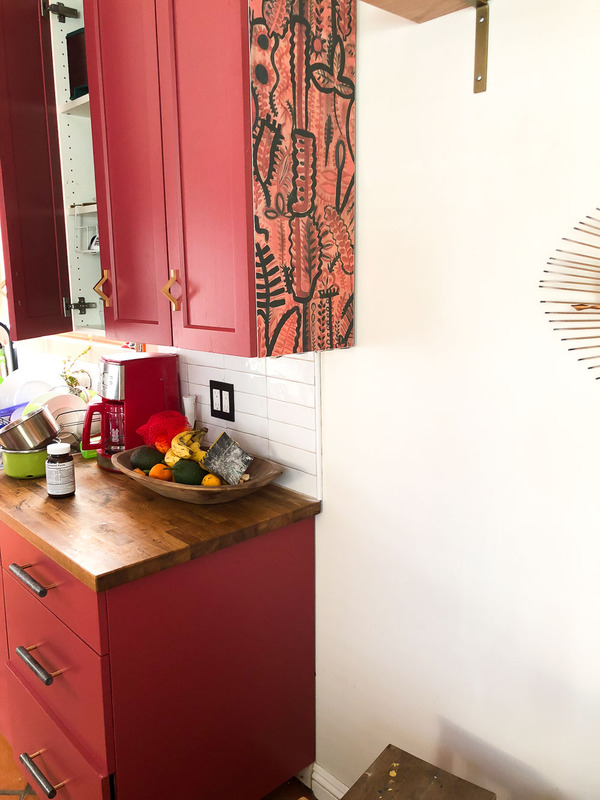 I will show you more photos of this beautiful cabinets once all the handles are on, but, for now, you will have to take my word for it: they look gorgeous, and they make the whole kitchen work!!!! Everything is finally coming together! 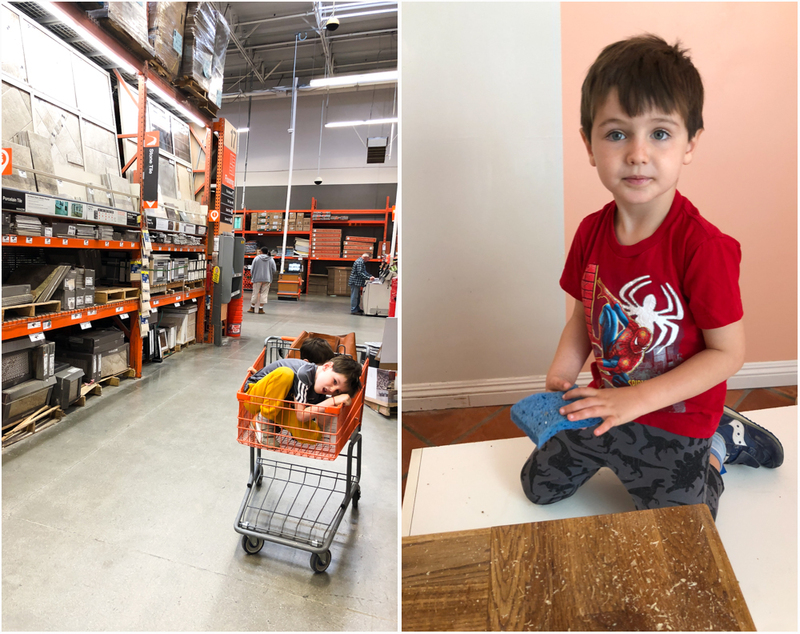 We are waiting for that gorgeous wallpaper from Lucy Tiffney to arrive so we can add it to the side of the cabinets: Here are the kids with me at Home Depot. They have been so patience and fun throughout the process. Here is also Max cleaning up messes because he likes playing with water and soap while being “extremely” helpful. Ok, readers, only two more weeks to go and I am thrilled with how all of is looking so far. I had a minor meltdown last weekend, if you follow me on Instagram, you know everything about it, but now, finally, I feel things are going in the right direction. 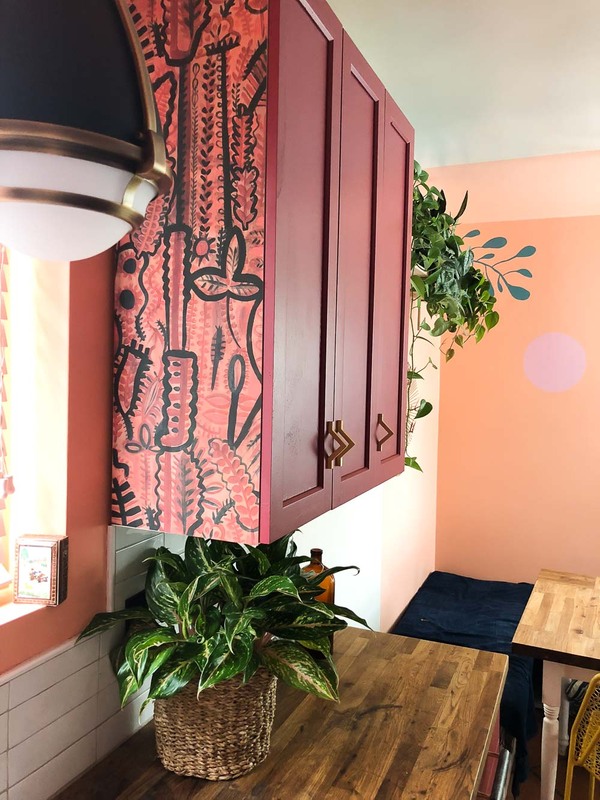 *Thanks to Cabinet Door Mart and Home Right for sponsoring this post, and thanks to you for supporting the brands that make Jest Cafe possible! Have a great week. A lot has happened in this Week 3 of the One Room Challenge and, also, nothing has happened at the same time. Let me explain. It is not finished yet but you can imagine where I am going. My plan is to paint the mural this weekend. Cross your fingers!!! 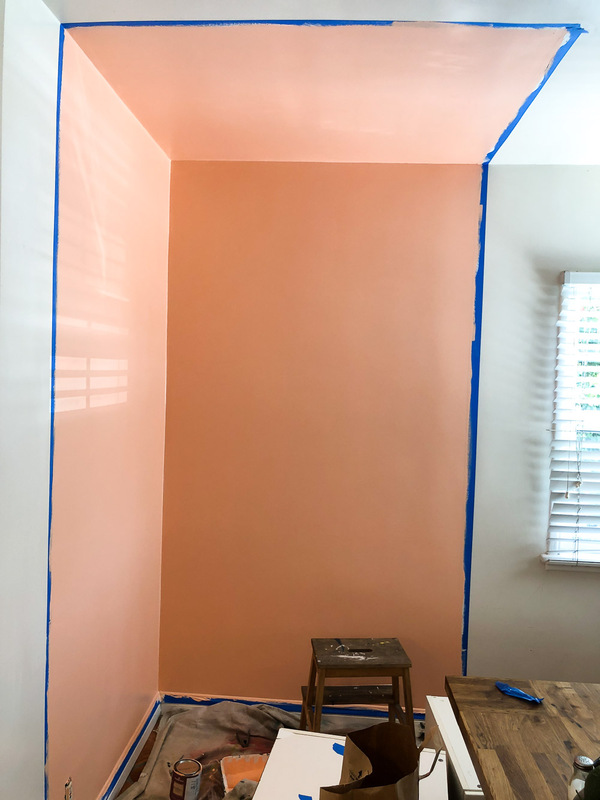 I framed the corner with blue tape and will paint the corner of this wall with a light coral paint. 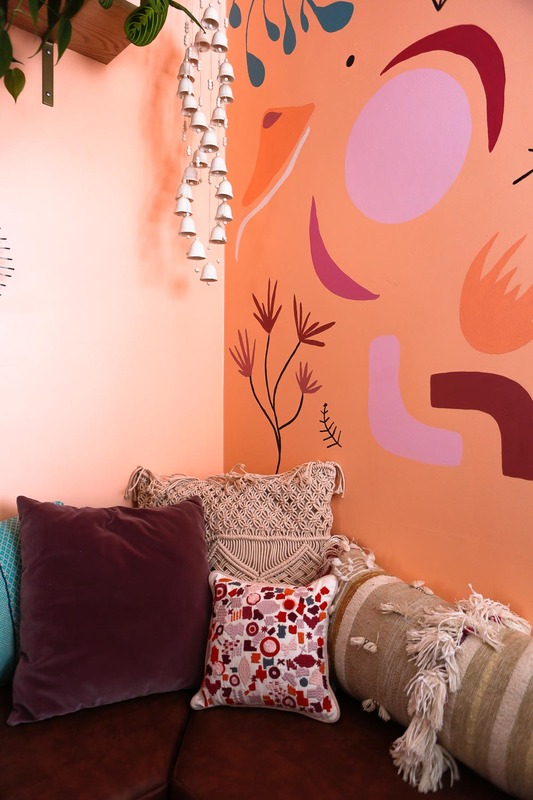 I like the idea of the contrast that the white and coral will create. 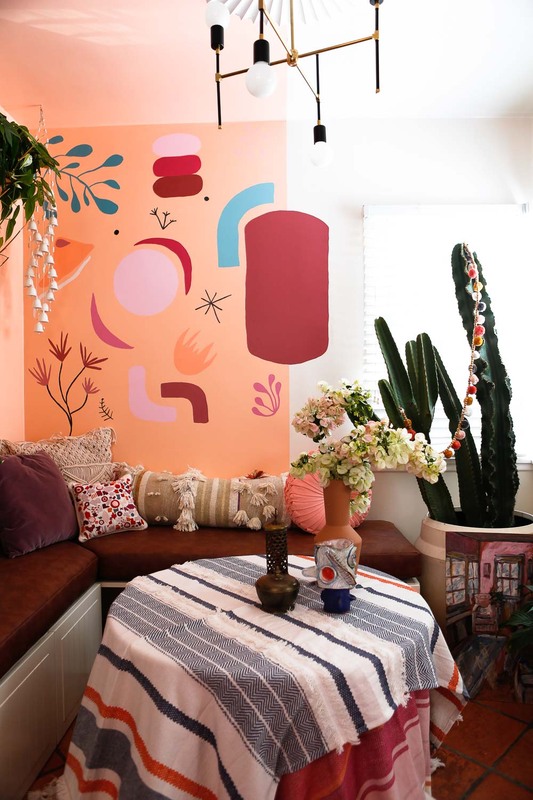 I also like the idea of taking the painting to the ceiling. 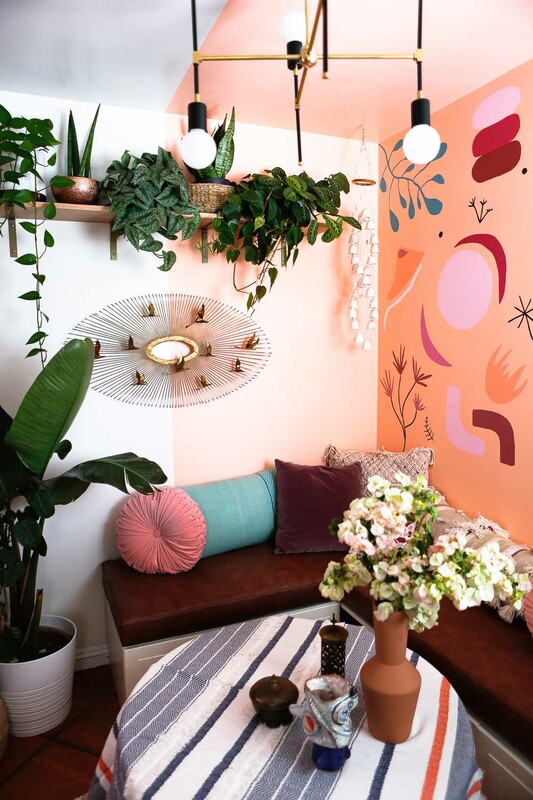 I am ALL for decorating the ceiling whenever possible because they have so much potential and they are always underutilized, don’t you think? 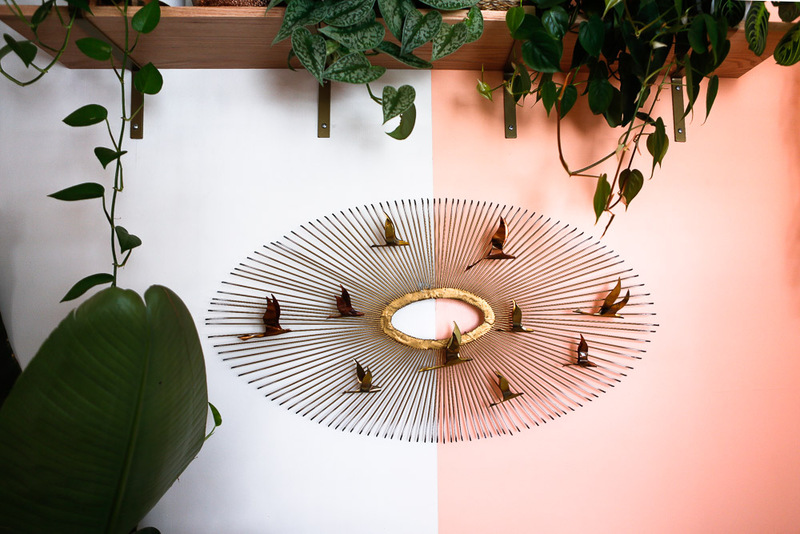 I also bought this metal wall sculpture by Curtis Jere. I have been after this piece since I saw this photo on Instagram. I mean, how cute is that? I finally found it on eBay at a reasonable price and bought it. I absolutely LOVE it. It is big, too: 37″ x 22″. It will go on the left wall of the dining room, below a small shelf that I want for plants. 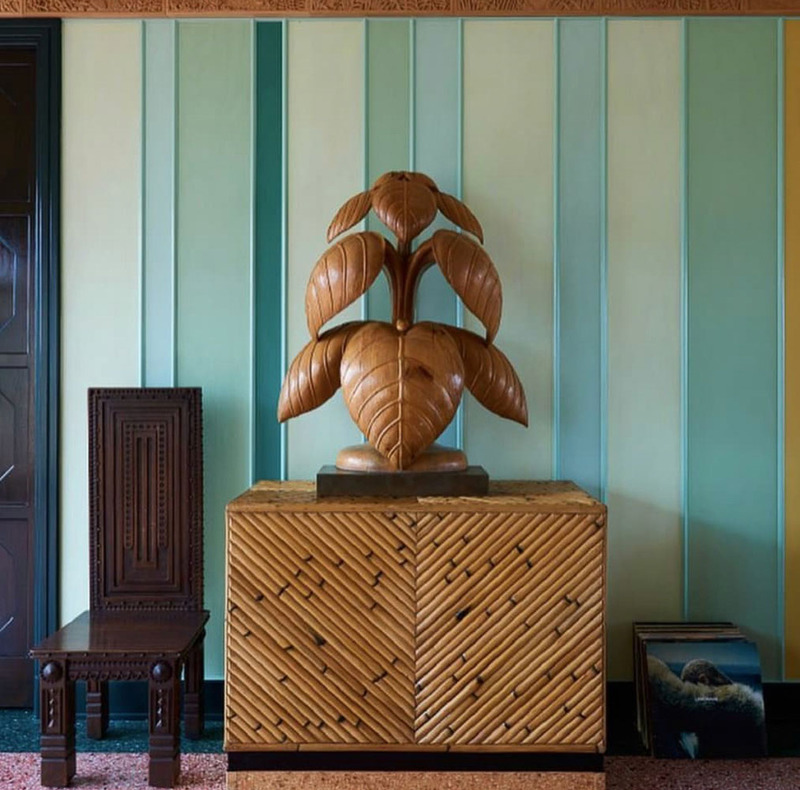 In some other good news, I found the most beautiful wallpaper I ever saw and I want to use it for the side of the cabinets. My husband will sand the countertops so the stains go away. I will also change the current metal faucet to a black faucet. Regarding the floor, I got a runner that I think will work in this space. Ok, those are my updates so far. Next week the cabinets and tiles should be installed so I will be able to give you a better update of what is going on. 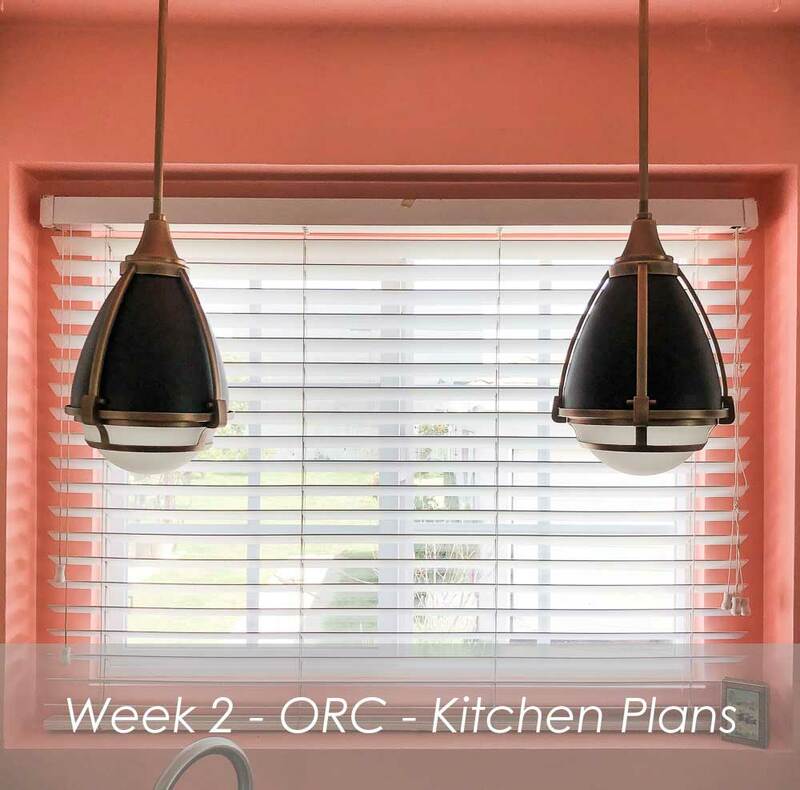 I am excited about this kitchen renovation!! After weeks/months thinking about it, the design idea is finally settling in, and I feel I am going in the right direction. The bad news is that we haven’t done much yet. I mean, the electrician came to hide all the horrible cables that were below the cabinets. 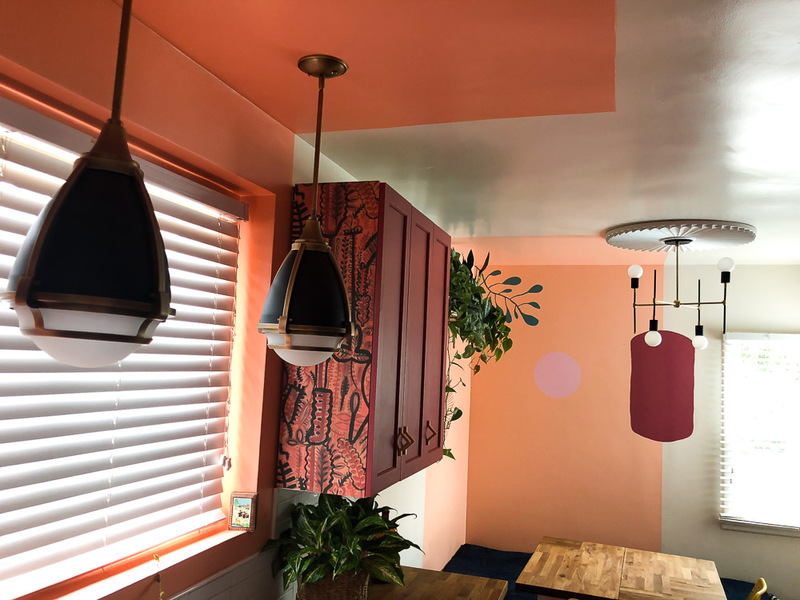 He also hung these beautiful pendants from Lamp Plus, and I painted some of the walls, as you can see in the photo above, but that is all that has happened, pretty much. 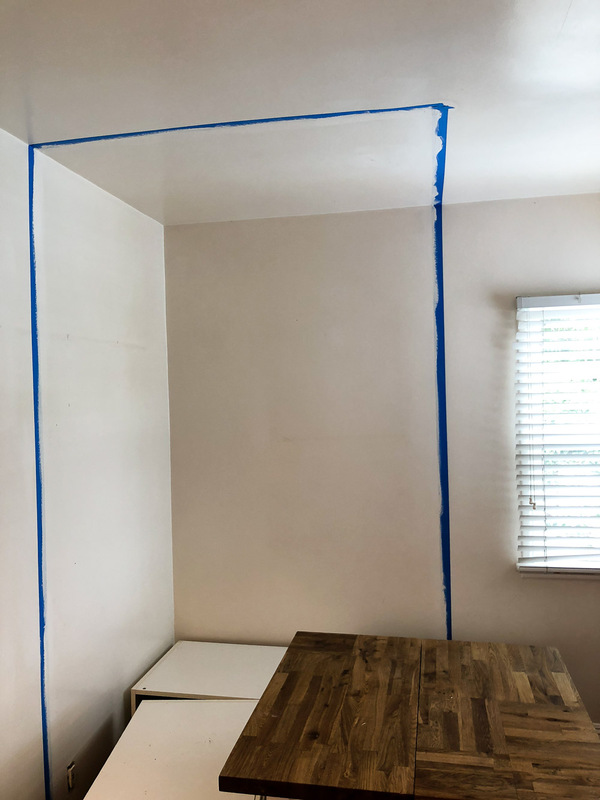 Painting process… do you notice how I painted over the blue tape with the same white color from the ceiling? This ensures straight lines after you paint with yellow. 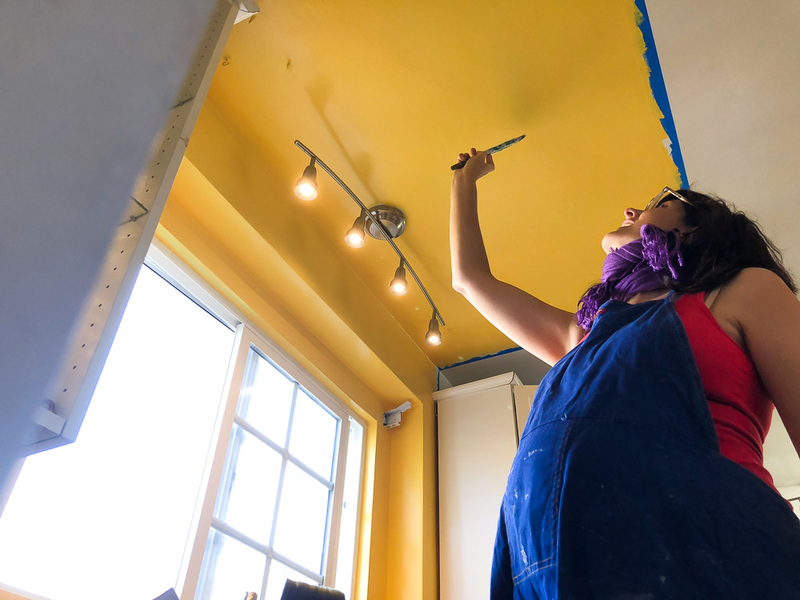 Me, pregnant, painting a ceiling… I mean… I am happy I didn’t fall and break my neck. Result: The problem is that I did NOT like the yellow. It was too vibrant, too obvious, too annoying! I couldn’t stand it. I like it a lot better, don’t you? Once I decided on some colors, I got samples and painted bigger papers to get a better look at the tones. 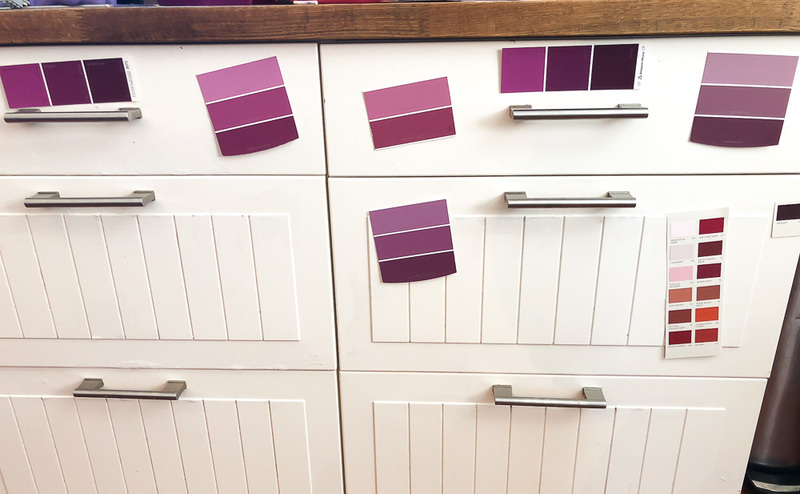 These swatches have been up on the drawers for weeks. I have already made my decision about which color to paint them, want to guess? Well, friends, that is all I have for you today. I hope next week I have longer and better news with plenty of updates. We will be working all weekend so, which us luck!